With the help of sidewalks(!) and google maps, we navigated our way down Yonge Street (the same one! ), and passed a Quaker Meeting House, from 1810, and through some urban green space. 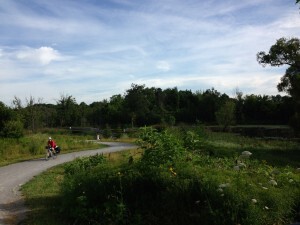 This included some wetlands and the Aurora Community Arboreteum. From there, we travelled along Highway 15, which became much quieter after the junction with the 404 (which, incidentally has better hard shoulders than any road we have been on, but prohibits cyclists). The countryside comprised large estate houses, stables, lots of corn and a tract of land exploited by Lafarge for gravel. By that time, we were on the Oak Ridges Moraine. 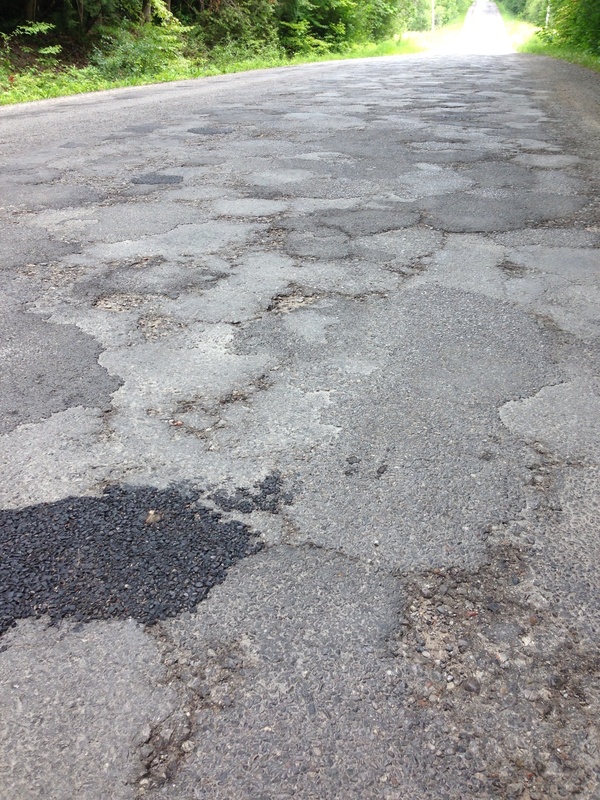 We know that to get our precious hard shoulders there is a need for aggregate, but the scars the pits leave are ugly. Travelling along the moraine also meant very hilly terrain. 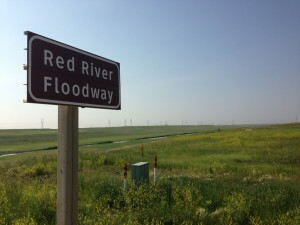 We headed to Highway 21, but its condition was amongst the worst we had experienced, so we went back onto side roads, which were much quieter but almost as bad! 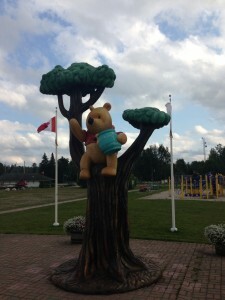 Eventually, we arrived at Port Perry. In the late 19th century, cargo from all over Northern Ontario came through Port Perry, via the Severn-Trent Waterway, and then to Whitby. David Palmer, said to be the founder of “chiropractic”, spent his childhood here. There are many interesting and attractive buildings on the Main Street, including the old town hall and and the building which now houses the Piano Inn 1884, where we are staying, in the seamstress room. 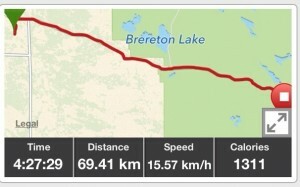 We passed the 5000 km point today! Medical note: Lois was stung on the neck by a bee. Fortunately, her personal physician was at hand with his well-stocked first-aid kit. Dr. Paul pulled out the sting-relief gel, which he applied liberally to the affected area, after which Lois could feel neither the sting, nor any sensation in half of her neck for the rest of the afternoon! We are on the traditional territory of the First Nations of the Upper Canada Treaties Area 1. The Mississagua of Scugog Island First Nation hold a pow wow each year in Port Perry. John was up early preparing a wonderful breakfast. We said our goodbyes to Catherine and John and headed out on the highway across the Grand River, where we got a lovely view of the old mill. 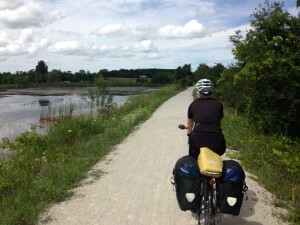 Luckily, we soon discovered that the Elora Cataract Trailway has a crushed rock surface which worked well for our bikes. 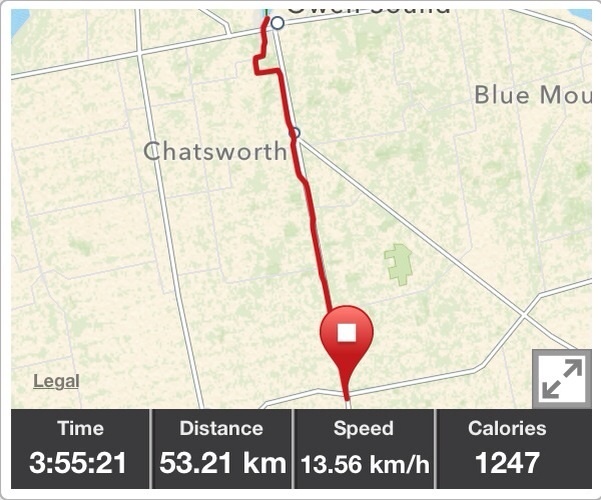 At the end of that trail, we took country roads to get to the Caledon Trailway. 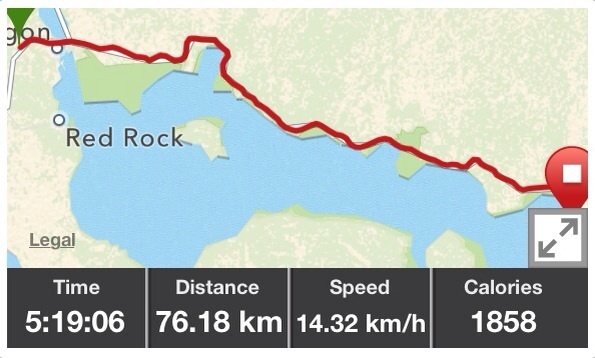 So, for almost 70 km we were on the Trans Canada trail and away from cars and trucks. It was such a treat and we made good time. 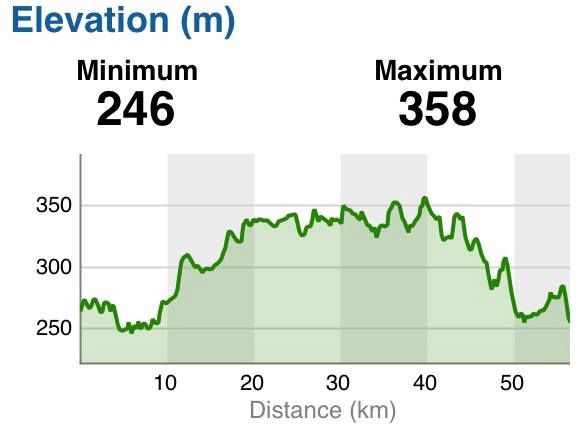 For the last 30 km we were not so lucky. 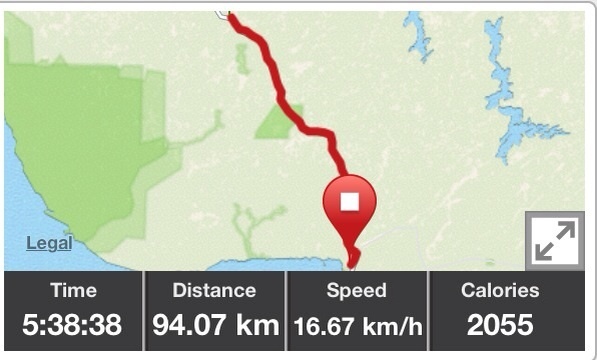 Highway 9 was very busy and we only had an adequate hard shoulder for the last few km. Newmarket seems to be part of the urban sprawl of greater Toronto. Breakfast at the Forest Edge B&B was served beside a floor-to-ceiling window overlooking the front gardens and beside the music room, which housed a grand piano. The owners are musicians and sometimes house musical events. We were served homemade granola with fresh fruit salad and the best scrambled eggs that we have had so far on this trip. Back on Highway 6, we headed south again. The wind, while still from the south, was not as troublesome as yesterday and it only rained for an hour or so. In a coffee shop in Mount Forest, we were asked if we wanted skim milk, soy milk, or milk for our lattes. We knew then that we had entered another zone! 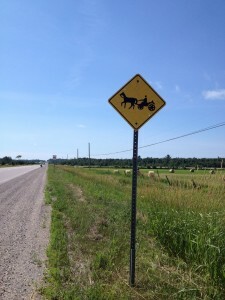 We saw another Amish horse and buggy in that town and heard the hooves skidding on the asphalt. Out on the highway, we got a return wave from a couple in a wagon, presumably as we were travelling under our own horsepower. There was a very narrow hard shoulder but a well maintained gravel one, perhaps for the horse drawn traffic? The route took us through rich farm land which was established in the mid 19th C. Many of the older farm houses are of a similar style with a Gothic arch in the middle of the roof at the front of the building. We stopped at a pioneer cemetery and most of the deceased had been born in Scotland. Settlers from there also founded Fergus, where we are staying with our friends, John and Catherine. 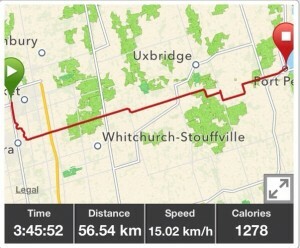 Later in the afternoon, they showed us around Fergus, as well as nearby Elora. 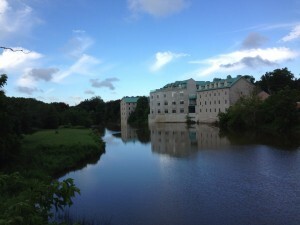 The Grand River runs past their house, which is part of the old mill buildings, and down the Elora Gorge and on to the south. We all ended a lovely day in the local pub where we ate dinner and played a trivia game with a large crowd of local people. The sound of the river accompanied us to sleep. Wildlife notes: Eastern Kingbird, call of a Northern Cardinal. We are on the traditional territory of the Six Nations of the Grand River, signatories to the 1784 Haldimand Treaty. One of Paul’s mother’s favourite singers was the contralto, Kathleen Ferrier, who sang “Blow the Wind Southerly”. Unfortunately, today, we were not able to share the positive sentiments in the lyrics. There was a blustery south westerly which was a strong headwind for us. 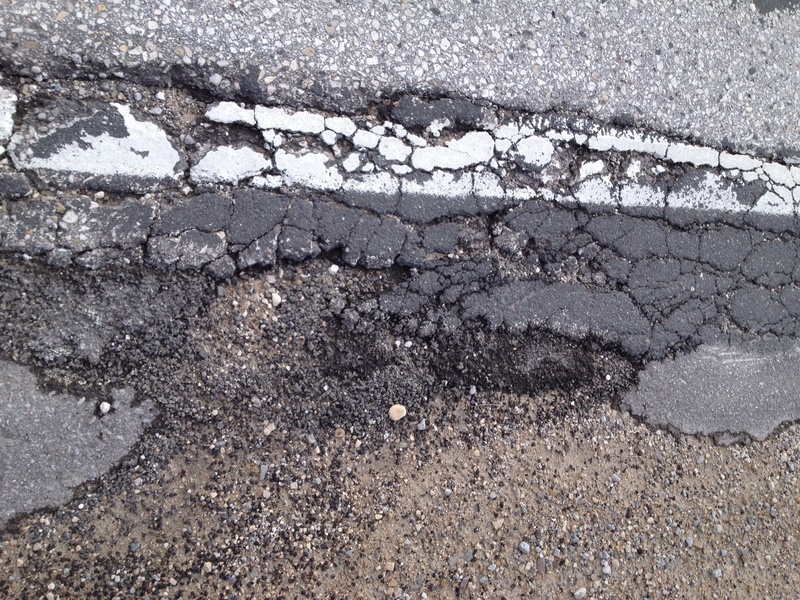 We left Owen Sound by a back way and the conditions were soon evident, as was the poor state of Highway 6/10. 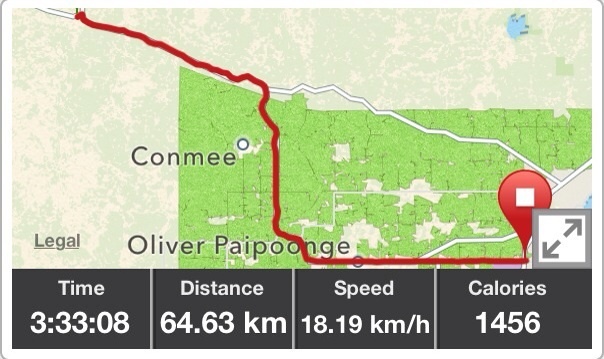 We passed a plaque relating to the old Toronto-Sydenham Road from the mid 19th C, noting the sentence, “Most of this old Settlement Road is still in use as Highway 10”. We are inclined to think that there has been little maintenance since its construction. The road was extremely busy with holiday/weekend traffic. The skies were full of dark clouds, with the threat of thunder showers. 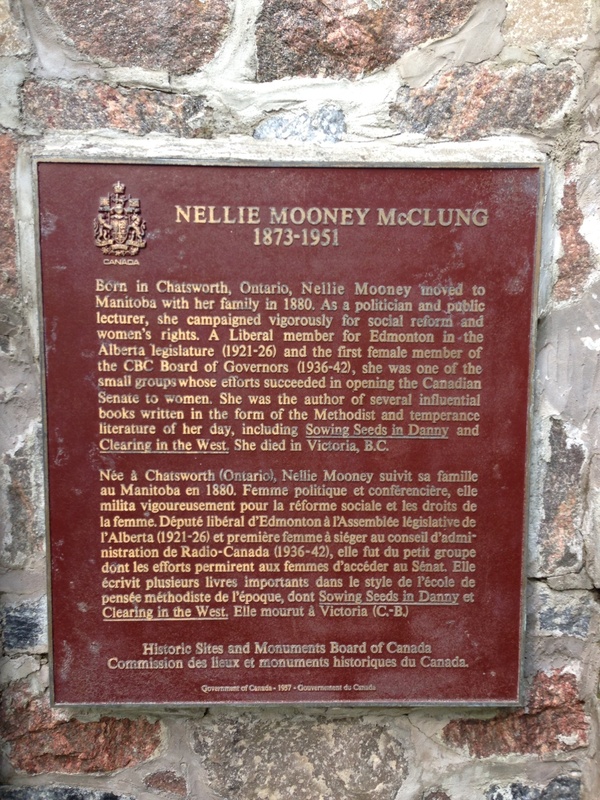 As we were making very slow progress, we strategized over coffee in Chatsworth, the birthplace of Nellie McClung. 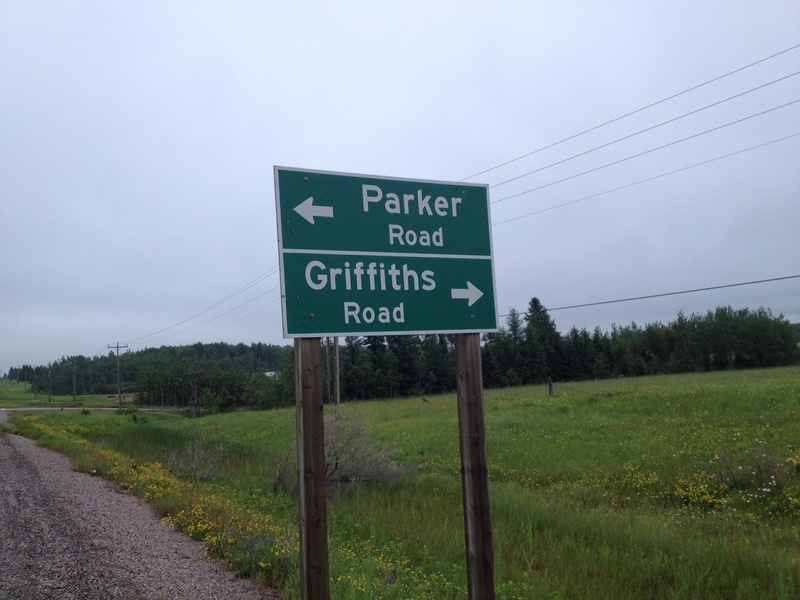 We had planned to get to Fergus, where our friends, John and Catherine, were expecting us. We decided to stay on the #6, which divided from the #10 at Chatsworth, and reassess things at Durham. 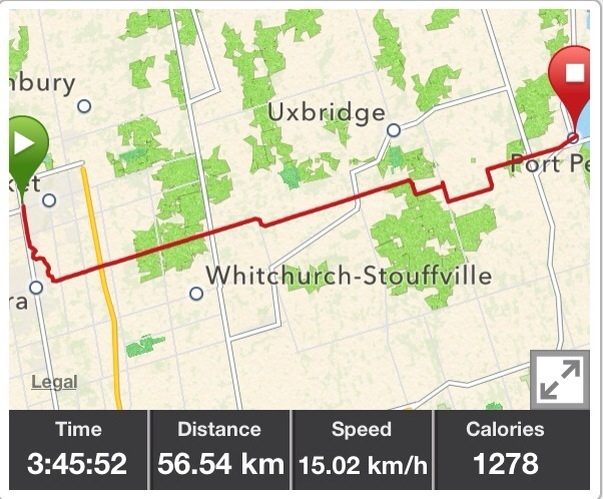 The road did improve and much of the traffic stayed on the #10; however, the wind did not let up and it was 1:30 before we got to Durham, with still 65 km to Fergus. After lunch at Gloria’s restaurant, which included delicious homemade rice pudding, we decided to call it a day and booked a room at the Forestedge B&B. The owner kindly offered us the use of his car to go out for dinner to the local Chinese restaurant. He apologized that it would not be the Cadillac, as his daughter was using that! Young’s Garden Restaurant has been in existence since the 1930’s (the current owners bought it in 1986). It retains the original decor of the 30’s, with wooden booths and bevelled glass mirrors manufactured by the Toronto Storage Fixture Company. Before it was a restaurant, it was a bank. The original bank vault is used as a storage room. They offered a good selection of vegetarian dishes and added tofu to a dish even though tofu wasn’t on the menu. The use of the car was particularly appreciated as it was pouring when we came out of the restaurant. We learnt that when Tanya and Jocelyn were ahead of us, Jocelyn left a message on a rock by the side of the road outside of Nipigon. Unfortunately we missed it. She has now sent us a picture. 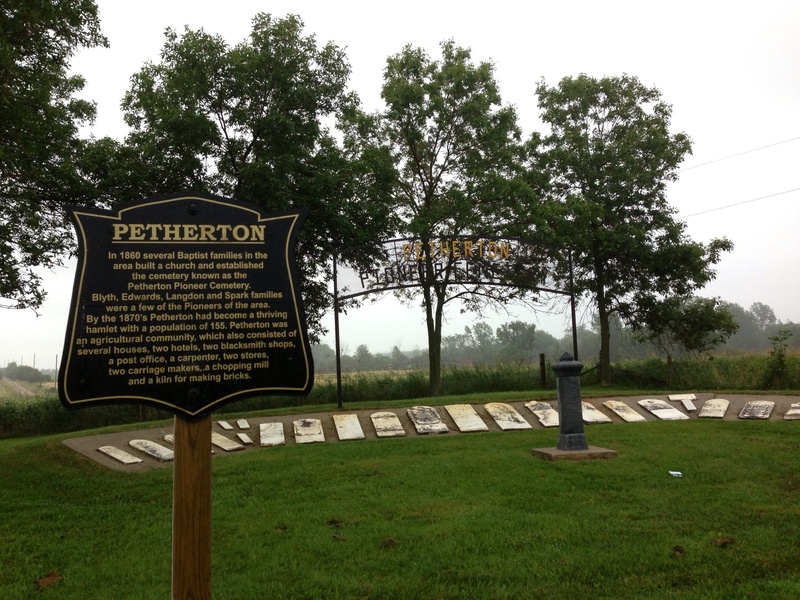 We are on the traditional territory of the First Nations of the Upper Canada Treaties Area 2. Ruth and John treated us to delicious homemade blueberry pancakes and very good coffee and we were on the road by 7:30. 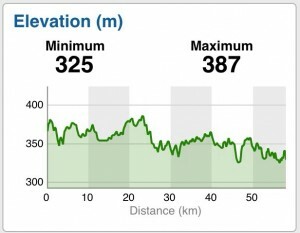 There was quite a strong headwind for most of the way and intermittent showers, but we made good time and did not get too wet. We stopped at Ferndale, but the coffee shop’s washroom was out of order, the gas station next door did not have one and in the one opposite, the attendants refused to give Lois the key without purchasing something! Lois, incensed by this and stubborn, refused to buy anything, though may well have done had it not been insisted upon, and rode another 5 km before finding some privacy beside the highway. It was here that John and Ruth caught up with us as they were on their way to Cambridge, so we said goodbye again by the side of Highway 6. We passed through farmland and woodland and noticed a few wind turbines as well as signs opposing this form of alternative energy. After lunch at the Green Door in Wiarton (thanks, Ruth, for the suggestion) and after taking a picture of Willie, we took side roads to Owen Sound to avoid some extensive road construction. The route was much quieter than Highway #6, with rolling hills. 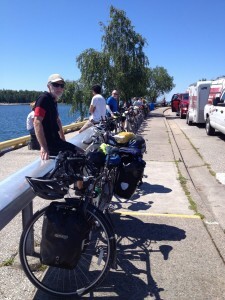 We saw the grain terminal and a large freighter in the port as we cycled in to Owen Sound. 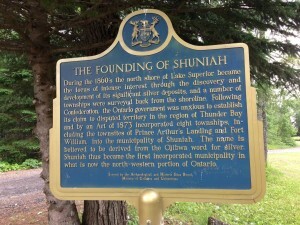 We are on the traditional territory of the Saugeen Ojibway Nation. 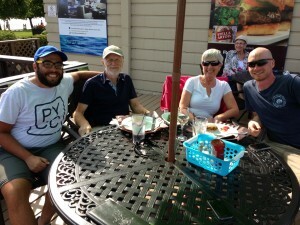 We have had a wonderful and relaxing visit with John and Ruth at their lovely home overlooking Lake Huron. Today, we walked around Tobermory, learning about its history and culture. Ruth was born and brought up in the town. The Visitors Centre of the Bruce Peninsula National Park gave us a valuable oversight of the region and we climbed the lookout tower and walked a trail to Dunks Bay, where there was a beautiful view of the clear waters of Georgian Bay and the Niagara Escarpment. 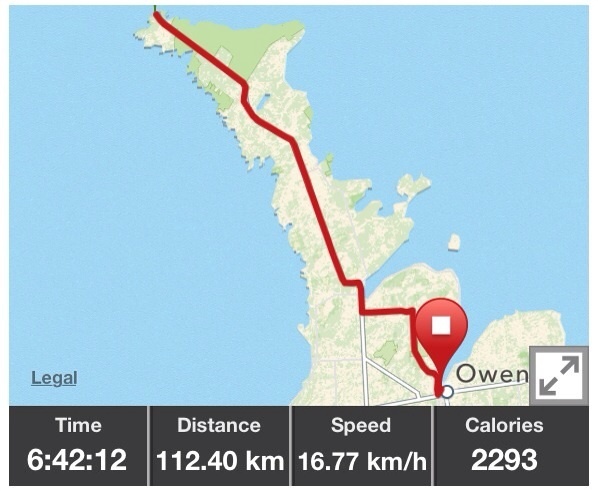 We feel refreshed and ready for tomorrow’s ride to Owen Sound, although the wind forecast is not favourable! It was a short ride in glorious sunshine to the ferry at South Baymouth. The southern part of the island is rolling hills, interspersed with farmland. We passed a number of Sandhill Cranes that rattled loudly at us, presumably protecting their young. 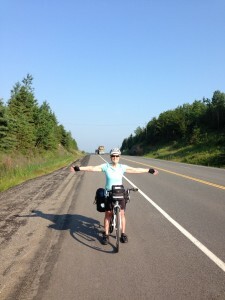 On the road, we met two cyclists from a Cycle Canada tour. This is the same organization associated with the accident last week, but a different group. We talked to a number of others in the tour while waiting for the ferry in South Baymouth. There was an interesting mixture of individuals and couples, including one man from New Zealand and another from Germany. While the idea of having all your gear transported for you while you ride unemcumbered is appealing, we are happy to be travelling on our own, with the flexibility that provides. 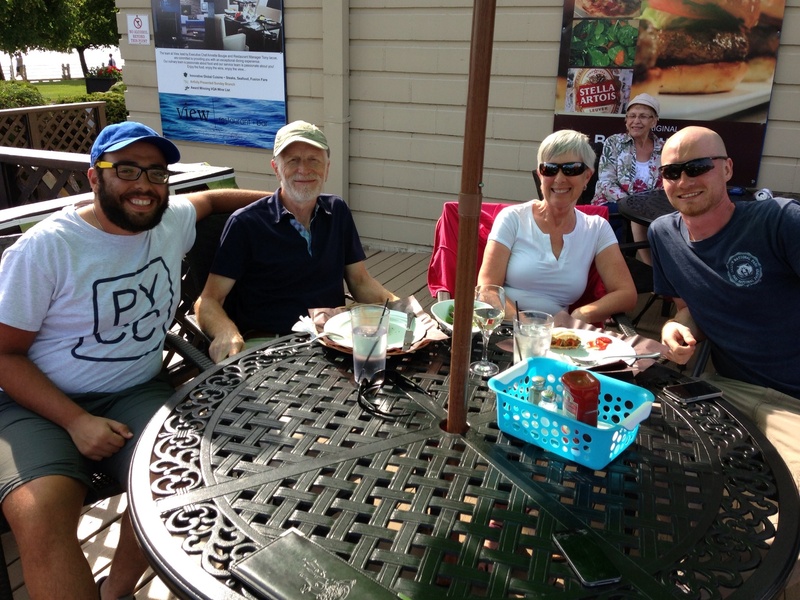 We sat out on the deck of the ferry during the 1 and 3/4 hour crossing and chatted with Stan and Shirley, the couple from the Okanagan. Other cyclists, e.g., Paul and Joe, are carrying on Highway 17. Our friends John and Ruth Bainbridge met us in Tobermory and we are staying with them in their house overlooking Lake Huron. We sat outside all evening as the sun went down listening only to the lapping of waves, rustling of the leaves and birds sounds. 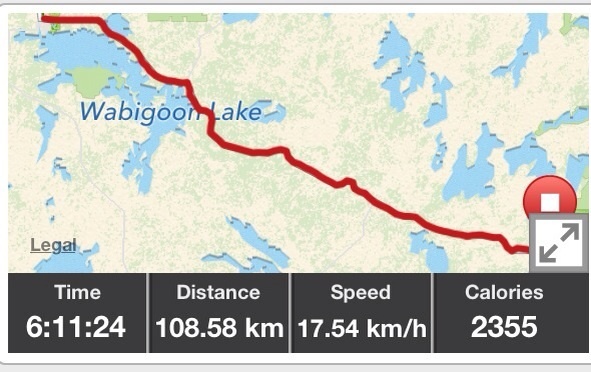 We learned today that a couple from Ontario, who were also cycling across Canada, were killed yesterday after being struck by a pick-up truck on Highway 17 (the TransCanada), east of Thunder Bay. Robert and Irene Booth were part of a Tour du Canada group cycling from Vancouver. They were just slightly older than us. We knew that the group was a week behind us. 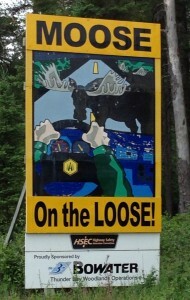 The accident happened on the stretch of road before Nipigon that we had found to be particularly dangerous. We are shaken and saddened by this news, and our hearts go out to the couple’s family, friends and fellow cyclists. 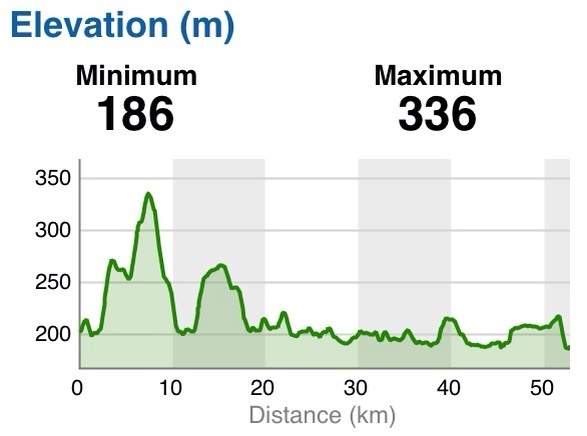 We would like to reassure everyone that we are cycling as defensively as possible. 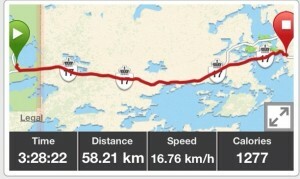 Unfortunately, it is impossible to avoid the TransCanada at times on a cross-country tour like this and an absent/narrow shoulder means having to cycle on the highway. The gravel shoulder is not manageable with the tires of a touring bike. While vehicles generally give us a wide berth when passing, they rarely slow down in doing so. Now that we have turned off Highway 17 to head south, we hope that traffic will be lighter, even if the shoulder issues continue, and, when we are in more populated areas, there will be more secondary road options. 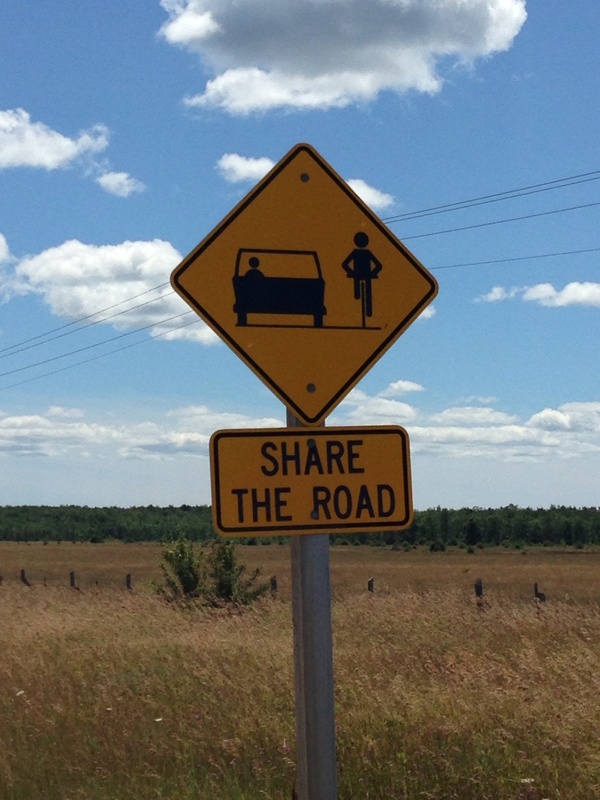 It is a sad reality that the only province in Canada with designated cycle routes outside urban areas is Quebec and that cyclists wanting to experience crossing Canada cannot do so in a consistently safe manner on the highway that joins the country together. The weather, traffic and road conditions will vary from day to day. This is part of the adventure and we know that some days will be better than others. We are still enjoying the trip and look forward to what comes next. Today was particularly good, with blue skies, a helpful wind for most of the time, lovely scenery and a good shoulder for some of the way. The news of the accident was disturbing, but we will continue our journey and keep as safe as we can. We are on the traditional territory of the First Nations of the Manitoulin Treaties. 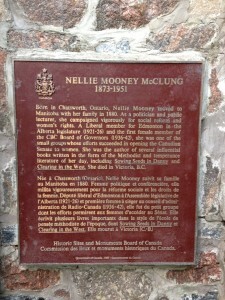 As you can see on the plaque in the photo gallery, the island was, in 1836, set aside as a refuge for all First Nations. However, the colonists’ expectations that the Aboriginal people would give up hunting and move to take up farming were not realised, and, under pressure from farmers and fishers, resident Chiefs relinquished most of the island to the Crown in 1862. The Wikwemikong People refused to cooperate and still retain Aboriginal title to the eastern peninsula of the island. The day started with smoked whitefish scrambled eggs for Paul and pancakes made with a homemade recipe with sautéed apples, for Lois. We chatted with one of the owners, whose partner is the chef. They have operated the motel for 15 summers. Business is not as good as before as they have many visitors from south of the border, but with the downturn of the US economy, this has changed; in fact 60% of local cottages used to be owed by Americans but that has decreased also. The owner recounted that cottages have remained in families for generations. The motel restaurant has one regular of over 90 years of age, who visited the area as a boy. 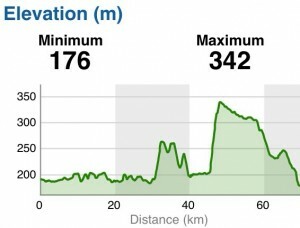 The initial part of today’s ride was great. 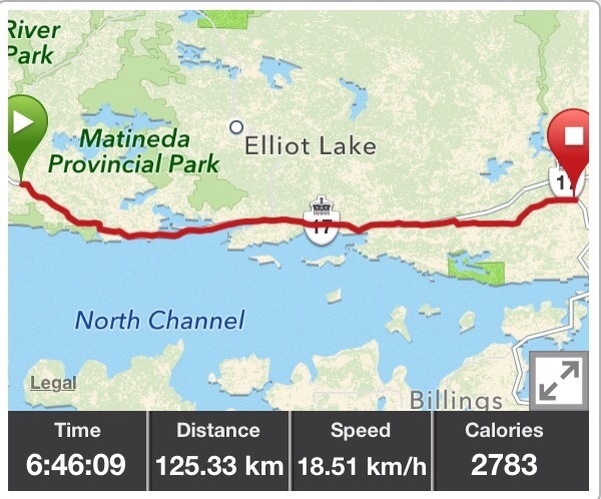 There was a strong tailwind and we made our way along the very picturesque Mississagi River. Later, the two-laned transCanada highway became much busier and the hard shoulder was almost non-existent. 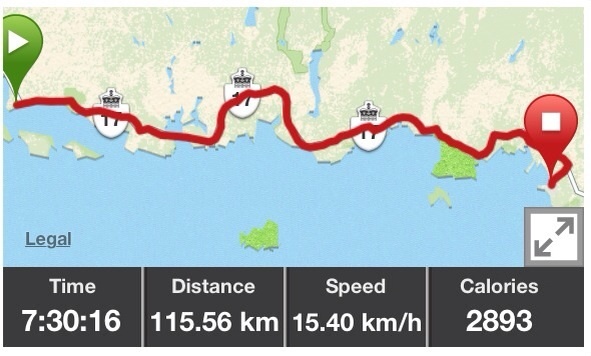 After several hours of tense cycling, we decided to go off the highway. We had met up again with Paul and Joe and they told us about a side route from Massey to Espanola, away from highway 17. They were ahead of us and, unfortunately, we missed a call to say that they had discovered that the road was loose gravel. By the time we picked up a later text, we were well into the route and turning back was not really an option. 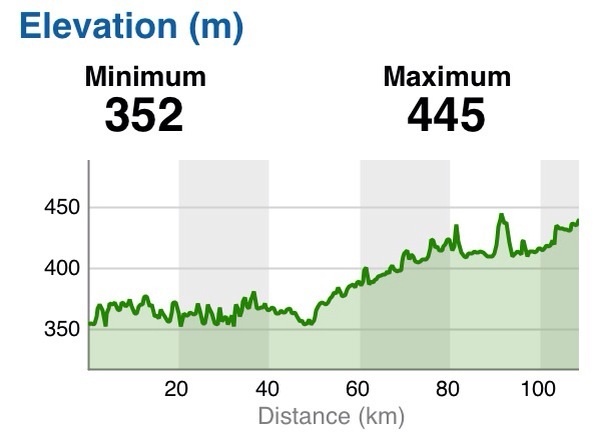 Of 30km, more than half was unpaved in preparation for re-surfacing. So, we had another exhaustingly eventful end to a day. We are on the traditional territory of the First Nations of Mamaweswen, the North Shore Tribal Council. We passed through the communities of the Missasauga and the Serpent River First Nations. Despite espresso and a latte at Dish, grilled cheese and vegetarian Denver sandwiches in Desbarats, ice cream in Bruce Mines and a wonderful salad with smoked whitefish, blue cheese and avocado at the Red Top Motor Inn in Iron Bridge, it was a really tough day. The headwinds were at 25 km/h gusting to 45, together with roads works with “grooved pavement” readying for re-surfacing. It was a very tiring and long day. 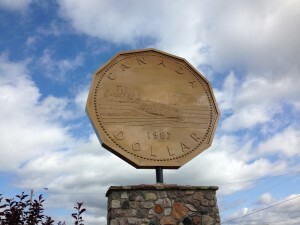 Did you know that a loonie has the initials RCC on it? This is for Robert-Ralph Carmichael who designed the coin and who is from Echo Bay where there is a very large replica in a small park by the road. 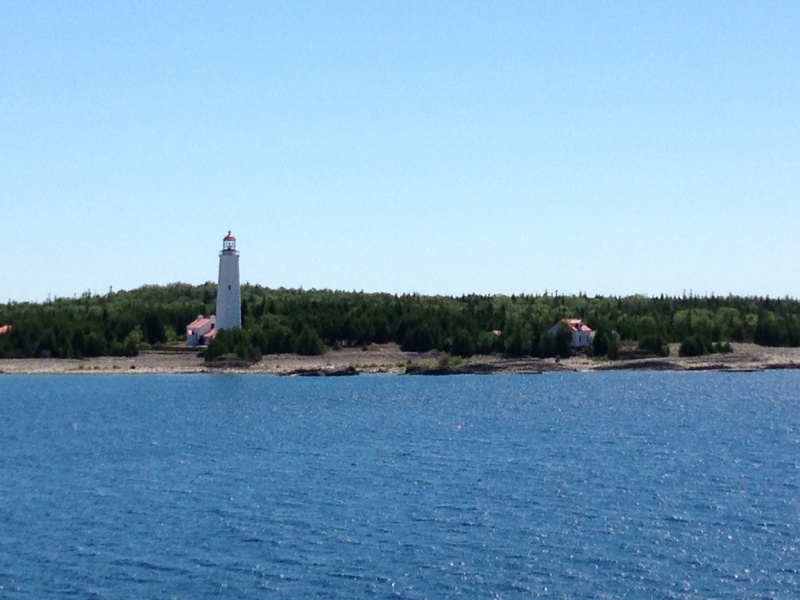 The land is quite different this side of the Soo. There are crops and hay fields. We were reminded of how long we have been on the road; the wheat was just sprouting in Saskatchewan whereas it seems to be ready to harvest here. 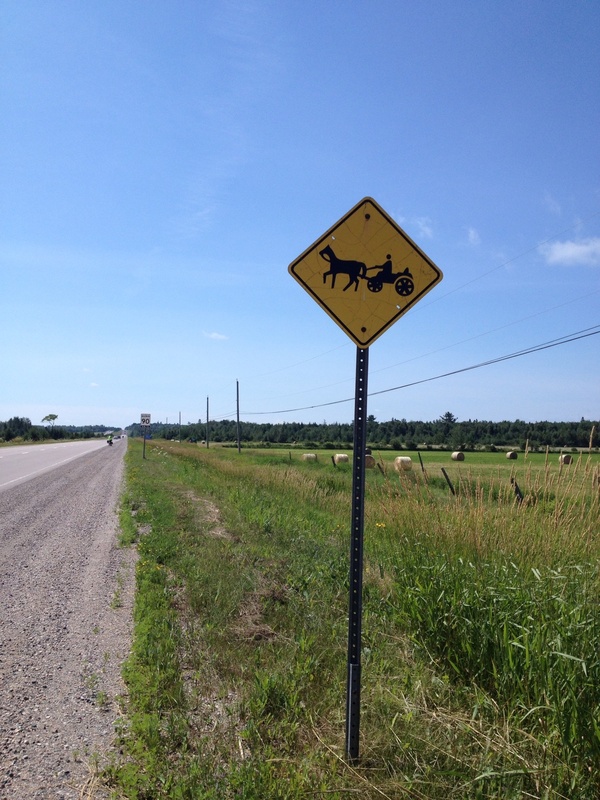 The road signs were an indicator of the Amish community here. We saw a road side vegetable stand (no sales on Sunday) with a wagon behind it and later in Iron Bridge a man driving a horse and buggy through the town. Wildlife Notes: Osprey at a nest. We are on the traditional territory of the Fist Nations of Robinson Huron Treaty. 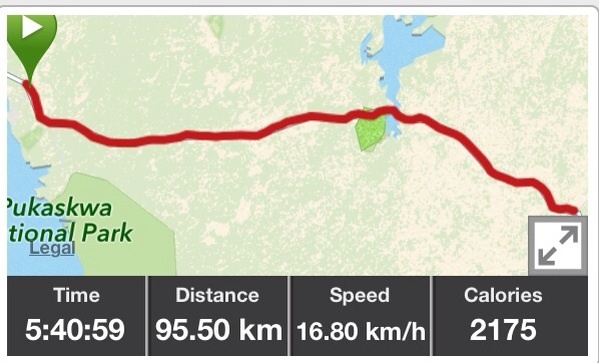 We passed through the Garden River First Nation and passed the Thessalon First Nation. We also saw a billboard promoting an artist who sings in Ojibwe. 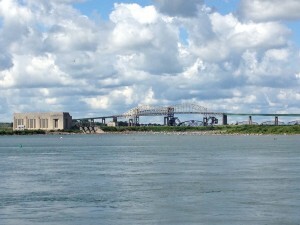 Today we explored Sault Ste Marie, although we did discover that few businesses are open downtown, on Sundays. 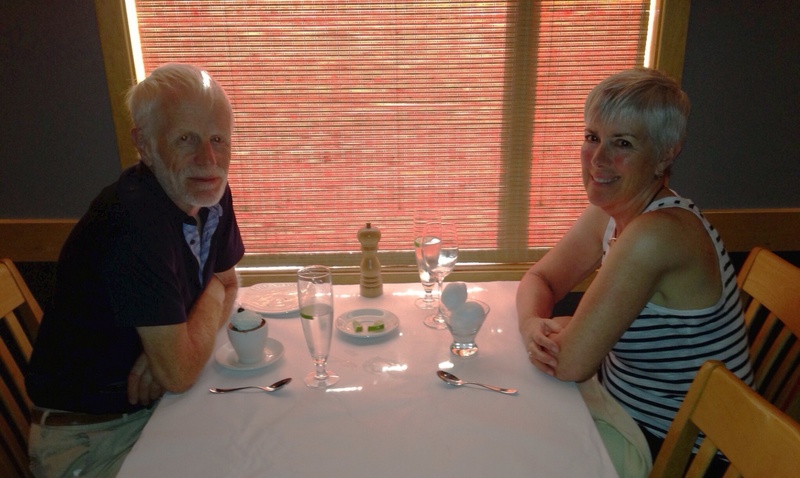 Eventually, we found espresso at the Delta Hotel, which we were able to have by appealing to the Maitre d’, who allowed us to sit outside on the patio, in the sunshine, before it opened officially. 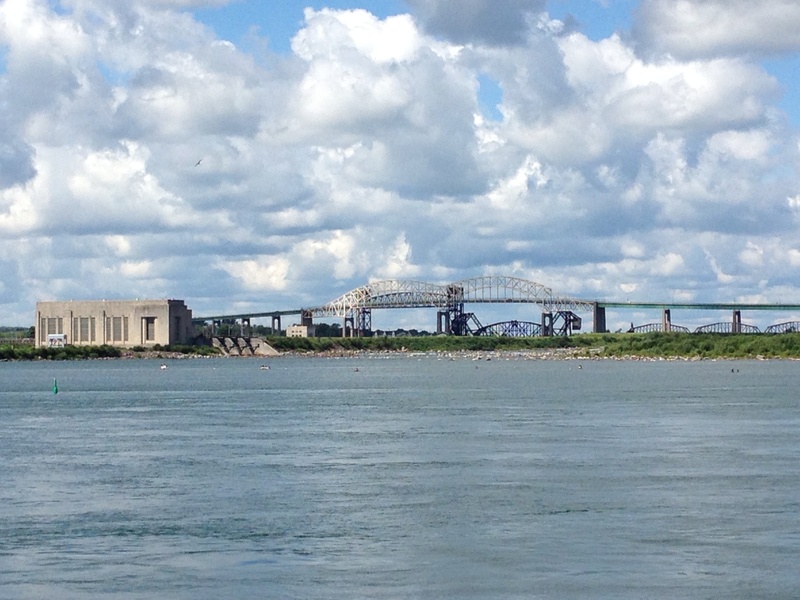 There is a walkway along St Mary’s River from where we could see the rapids (sault), the locks and power stations, on both sides of the Canada/US border. Two ships, very large “lakers”, were going through the locks in the distance. The war of 1812 was being celebrated this weekend and there were three tall ships moored by the Roberta Bondar Centre. Such ships were built in the “Soo”. 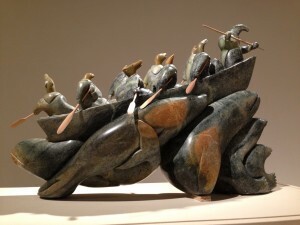 The Art Gallery of Algoma is a small gem and the exhibit of Abraham Anghik Ruben’s sculptures was a great find, as well as paintings by Jackson, Lismer, Casson and Emily Carr, among others, from their permanent collection. Later, on returning to the Delta patio we met up again with Paul and Joe. It is unlikely that we will see them again soon, but we will keep in touch. We shared experiences of Thursday’s storm. 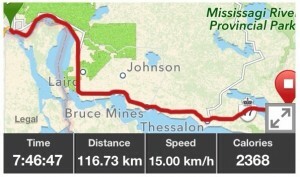 Our arrival in Sault Ste Marie marked the end of another stage in our journey and we do feel a real sense of accomplishment. 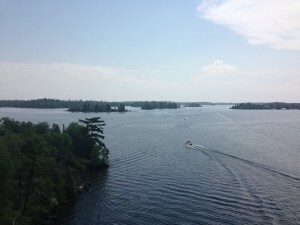 The mountains were followed by the prairies, which were followed by the rugged hills of north-western Ontario (noting that most of the province lies even further to the north), and Lake Superior. We are now eager for the next phase, in southern Ontario, seeing new country and old friends. It was a beautiful morning as we cycled around the bay. We savoured our last view of the lake as we shared a delicious apple fritter from the Voyageur Cookhouse. 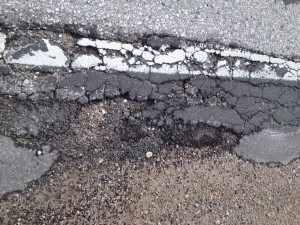 The road is falling apart at the edges on the stretch into Sault Ste Marie. Unfortunately, that is where we have to cycle. At Chippewa Falls, we saw a plaque commemorating the cross Canada trek of one Dr Doolittle in 1925. He did this by a car, which could go on rails when necessary. 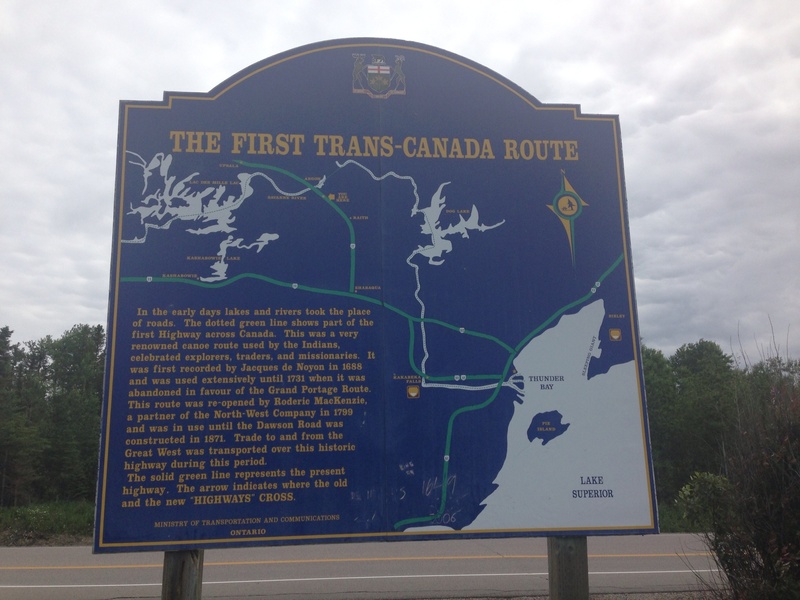 He was promoting the idea of a route to join the country together and is credited with the idea of the trans Canada highway. When trying to negotiate the potholes and cracked narrow shoulder, we thought how different it might have been had he used a bicycle! 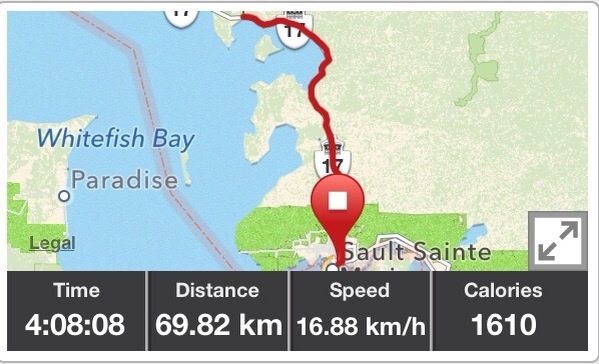 Before we got to the “Soo”, there was one more hill of note. 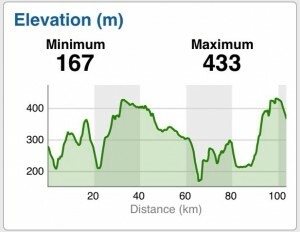 Mile Hill is mentioned in all of the blogs as being tough. One cyclist, though, said that it was no worse than some others on the trip except this one has a name! We agreed, but were pleased (and satisfied with ourselves) when we got to the top. 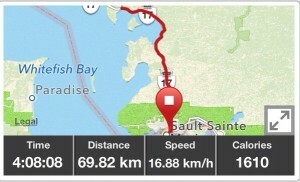 Also mentioned by others is a bike store called Velorution on the outskirts of Sault St. Marie. 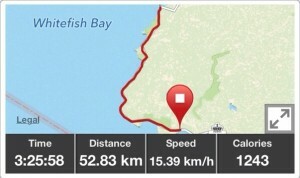 They have a campsite which is free for X Canada cyclists. They were very welcoming. 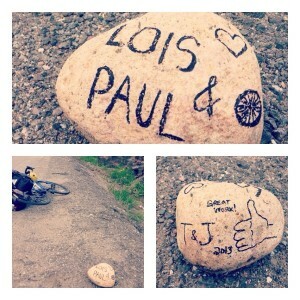 We signed their guest book, had free espresso and bought a new pair of gloves for Lois. 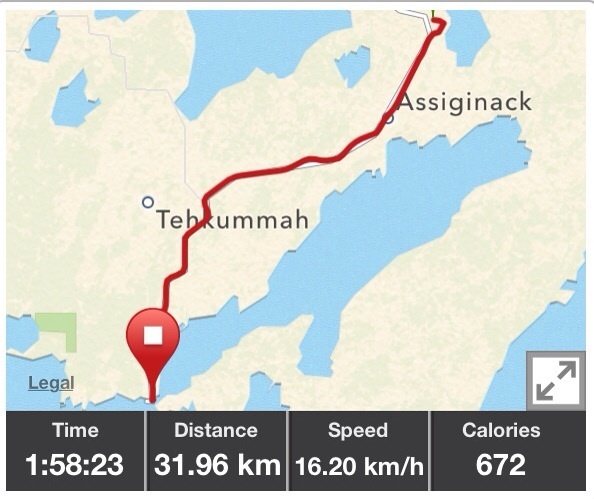 This time, we had decided to stay downtown and are close to the water and the old Algoma Central Railway Station and also within walking distance of the Timely Manner restaurant, where we had one of the best meals of our trip. We have a day off tomorrow. 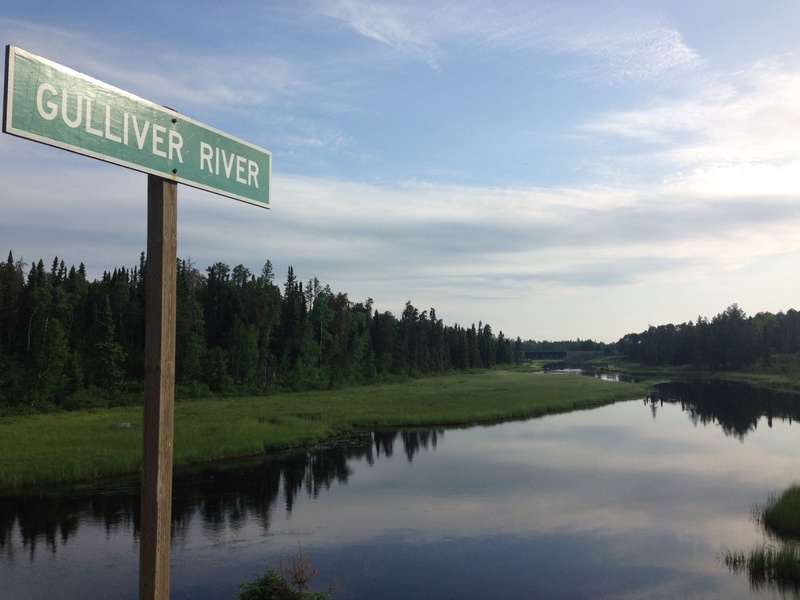 We are on the traditional territory of the Garden River First Nation. The thunderstorm continued into the night and it was still raining in the morning. We decided to wait it out for awhile, as our shoes were still wet from last night and we were reluctant to get soaked again. While at breakfast in the “chip wagon”, we heard two gunshots. The owner did not seem particularly perturbed and said. “That must be Ricky, shooting at a bear”. At the time we were sitting next to a gabage bin with claw marks from a marauding bear last year. Apparently there were few berries available that summer and so it ate all of the peanut butter and jam instead. On leaving the lodge, we did not see Ricky, or the bear. 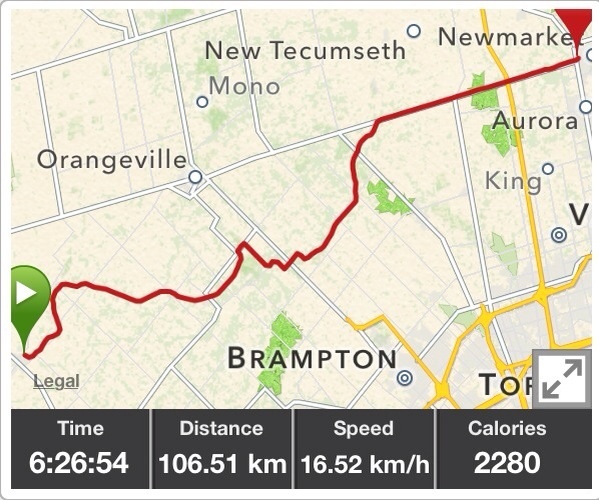 During the short ride, which still managed to include a few very steep hills, the clouds started to lift and the headwind improved. The highway was very close to the lake and we had marvellous views. On the way, we saw a number of downed trees and broken branches from the storm. 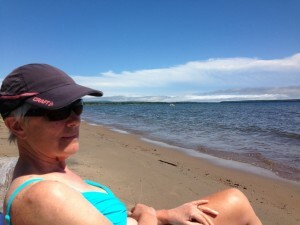 By the time we got to Batchewana Bay, the sun was out and we could sit on the beach. What a difference a day makes. We are on the traditional territory of the Robinson Superior Treaty First Nations and close to the Batchewana First Nation community. They are developing a wind farm on their land. We saw one sign objecting. We had to wait until 8:00 for the Best Northern Resort restaurant to open for breakfast, but it was worth it for both the espresso (made with a Jura machine – and the only espresso machine in Wawa, according to the owner) and crispy pancakes with fresh berries and peaches. We left with more peaches and cheese and marinaded eggplant sandwiches on focaccia for lunch. After a few km we caught sight again of Lake Superior. 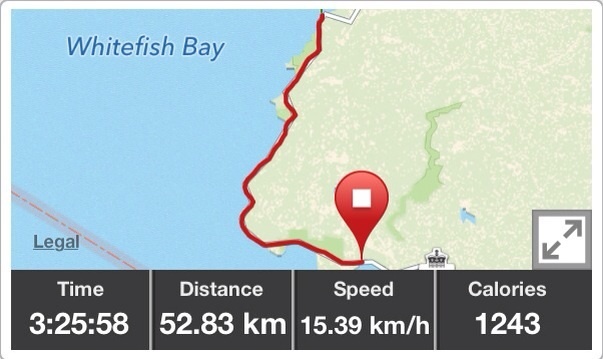 We cycled to Old Woman Bay just to sit on the beach for a while. It was wonderful and serene. 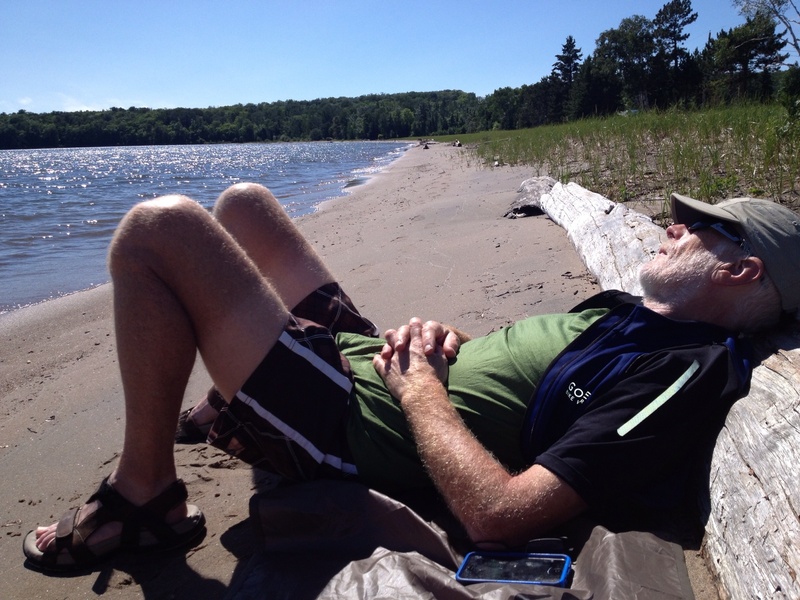 After another 50km , we arrived at Katherine Cove, where we ate our lunch and relaxed on the edge of the lake for some time. We had hoped for a swim, but the weather was cloudy and cool. We were reluctant to leave but still had 30+ km to go. It was unfortunately too far off the road to see the Agawa pictographs, so we made for the Agawa Bay visitors centre on the edge of the beach. We had camped here in the past with Maritia and Chris. As we left, we noticed that the sky was increasingly dark to the north and we heard thunder. 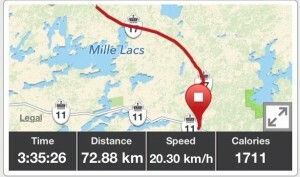 Pedalling furiously, we thought that we would miss the storm, but it caught up with us about 10 km from Montreal River. We huddled beside a guard rail for a while, trying to shelter beneath our tarp. We eventually decided to carry on, with lightning flashing all around us. 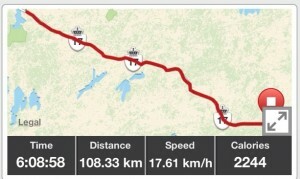 The wind and rain were so strong at times that we had to walk our bikes and on the long hill down to Montreal River we gripped our brakes tightly. With great relief, we arrived at Twilight Resort Cabins and Campsite. This was the only accommodation between Wawa and Batchawana Bay, and although “rustic” , it got us out of the storm! We bought tinned baked beans, potato chips and chocolate bars from the camp store and (vegetarian) poutine for Paul, from Twilight’s “chip wagon”. This is a vast and beautiful country! 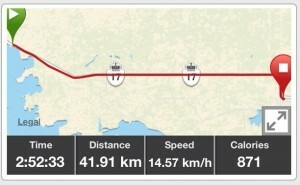 We have now cycled over 4000 km, more than half of our expected total. 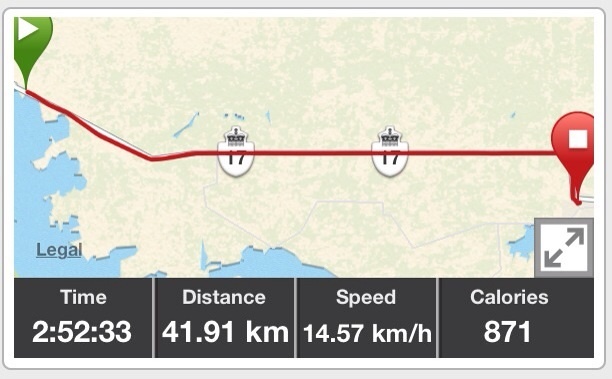 1/4 of this distance has been in Ontario. 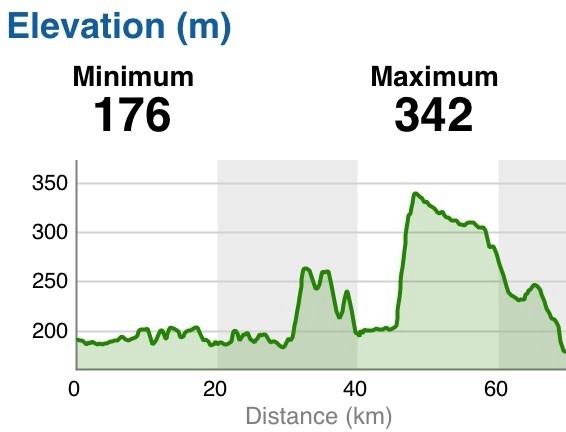 It was a good day – the hills were smaller and the temperature cooler. 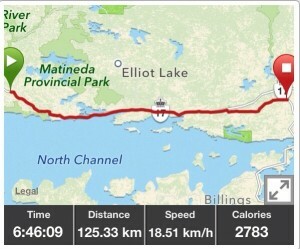 We started off in rain, but the system moved ahead of us and we soon stripped off the Gore-Tex. The humidity meant lots of bugs, however, especially black flies that manage to find the gaps in our helmets! The road took us south, inland from and parallel to the lake. The name Wawa comes from the Ojibwe word wewe meaning wild goose. A 9 m steel statue of the Wawa Goose stands near the junction of Highway 17 and 101. We stayed at High Falls Motel and Cabins, a great find just south of Wawa. The owners gave us a lift to an excellent restaurant down the highway, where our meal included freshly-made pierogi and ended with pavlova and espresso. 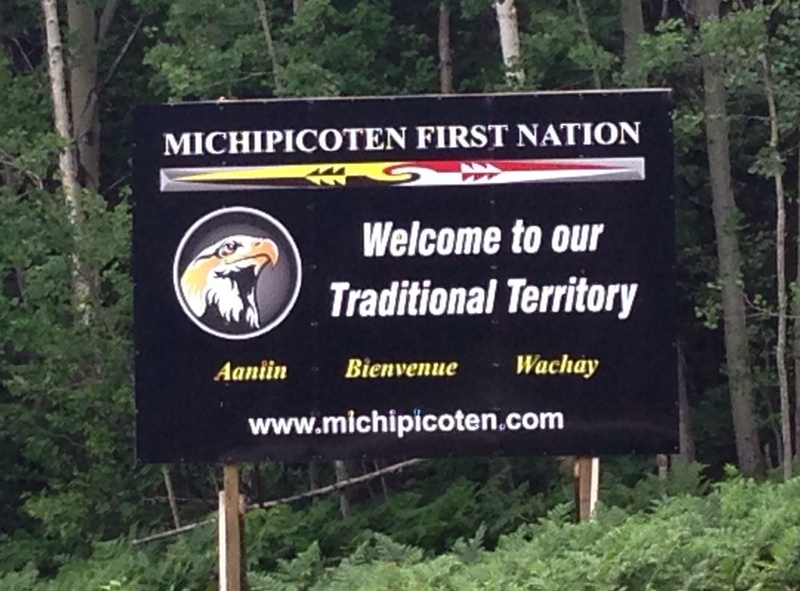 We are on the traditional territory of the Michipicoten First Nation Their history is unfortunately not unusual. 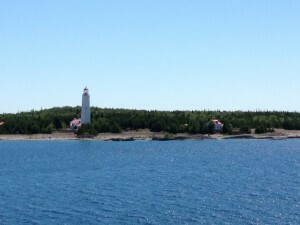 They had traditionally lived at the mouth of the Michipicoten River. This is not longer the case. We had coffee with Paul and Joe before leaving Marathon. 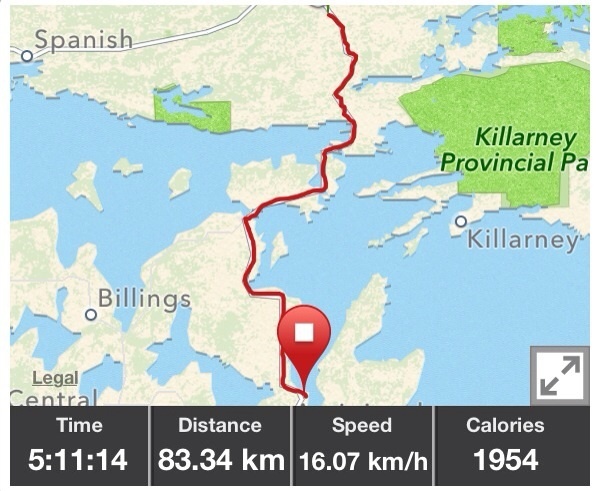 We had left Lois’ bike computer in our room in Rossport. Luckily, they had stayed at the same place and kindly brought it with them. After a steep descent and climb at the beginning, followed by 10 kms of flat, the terrain was undulating for the rest of the day. 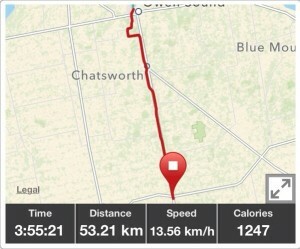 It was good cycling, but hot, reaching 35C on the Garmin. The blackflies are biting now! We stopped for milkshakes at White Lake. A young woman told us that she had driven by us earlier when we were sitting on a rock having our lunch and she had seen a wolf very close to us on the highway. We missed it! Paul had his first flat tire of the trip caused, again, by wire from truck tires. 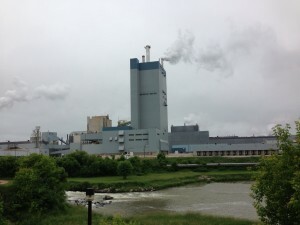 The pulp mill in Marathon has been closed for four years. The other employer is Barrick Gold. We passed the mine. The company is Canadian and is the largest gold producer in the world. It has been widely criticized for its environmental practices and relations with indigenous peoples outside Canada. White River is the birthplace of the story of Winnie the Pooh, which is celebrated in a small park. The town’s lumber operations have been closed for a time but are now due to re-open as a result of an agreement with the Pic Mobert First Nation. We are on the traditional territory of the Nokiiwin Tribal Council First Nations. Trees and rocks, rocks and trees, and HILLS…and water. It was a good day, but a tiring one. 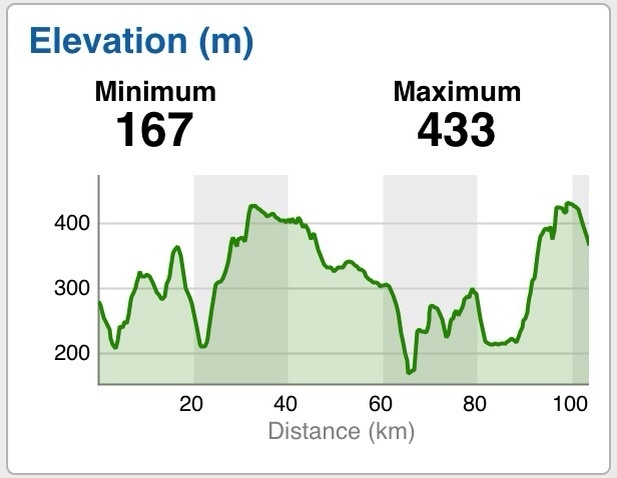 The winding road and hilly terrain continued, with many challenging steep climbs. It feels like the Rockies all over again! The rain had stopped by morning, but we left in a thick fog and the mist lasted for much of the day, making it difficult to see what was coming up. We kept our headlights on the whole time. 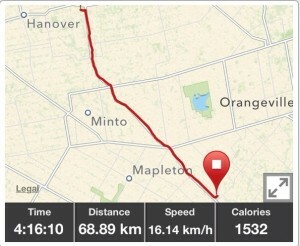 On the plus side, there was no wind and the hard shoulder was not bad for most of the way. We met fellow cyclers Stan and Shirley, from the Okanagan,, who are also riding from Victoria to St. John’s. They are the first cyclists we have met on this tip who are apparently over 40! They did not seem too happy with their experience, however. 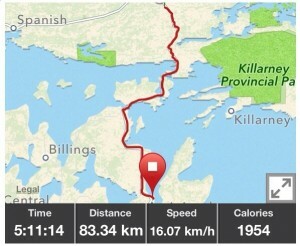 This contrasted with the enthusiasm of Kim, who started in Halifax and was going to Tofino. She had just seen what was probably a wolf on the misty road and was still a little shaken by the close encounter. 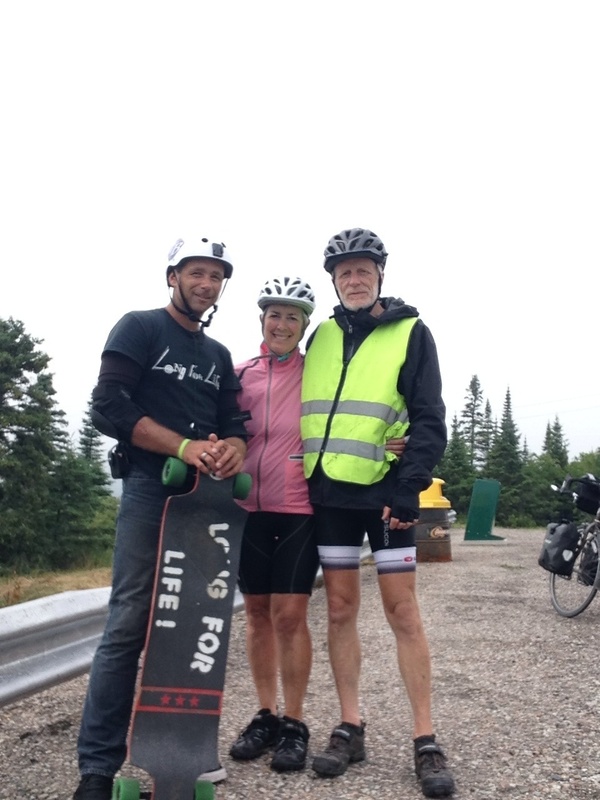 We later met Francois and Eric, who started from the Quebec Ontario border and are heading to Vancouver. On turning into a picnic spot, we met Michael who is long boarding across Canada with his son, raising money for cancer research. 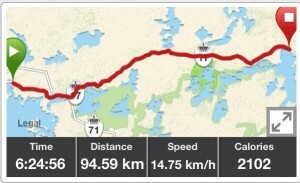 Tomorrow, we head east, away from the lake for a couple of days, and are expecting a flatter road! 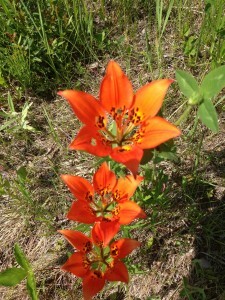 Wildlife Notes: for Anne, we saw no moose or bears! We are on the traditional territory of the Matawa First Nations. 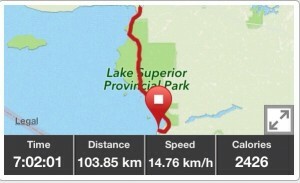 It was a much hillier ride today, giving us great views of Lake Superior, even in the rain and mist. The shoulder remained narrow or non-existent, but was less of a problem today as the weekend traffic was lighter. 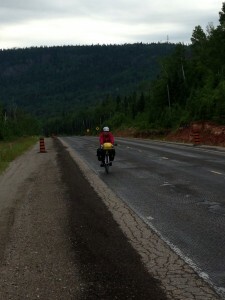 We had some very long climbs, some of which were on a long stretch of highway which had been stripped for resurfacing. The corrugated surface was like riding on one continual rumble strip! At the top of one long hill, we drove a short way off the road to a picnic site, where we thought we might make espresso and look at the view, but no-see-ums (midges to the English readers) descended upon us in droves and literally drove us away! It rained on and off all day and the average temperature was only 12C. 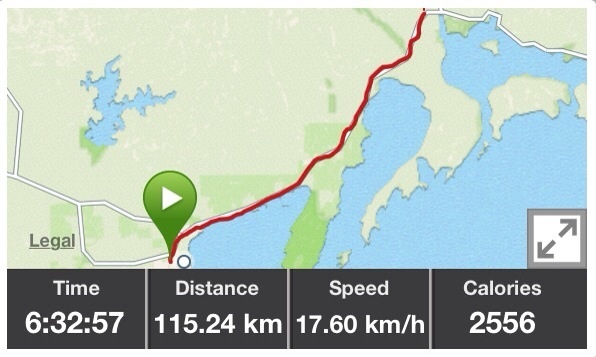 We also had a headwind at times. We hoped to stop for lunch at Gravel River, but the motel and cafe was closed, with a “for sale” sign in the window. We sat outside at a picnic table and had a quick snack before fleeing the bugs again. 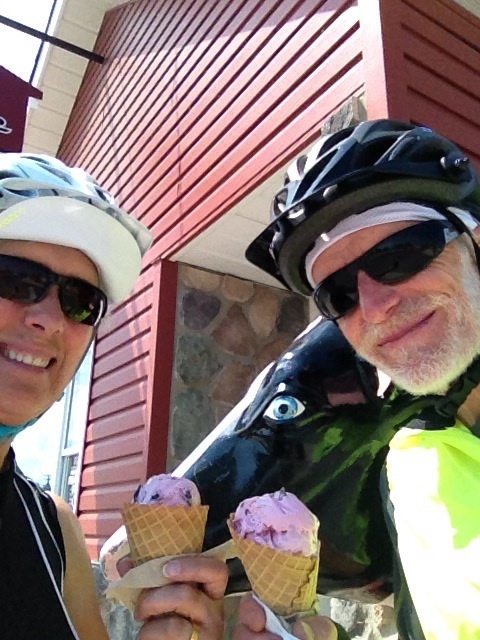 After 75 kms we came to Rossport. At this point, it was raining heavily. We pulled into the Serendipity Gardens Cafe and Guesthouse for a late lunch. i think we were both thinking the same thing as we hung up our dripping jackets. Given the hills still to come, we decided to call it a day and spend the night here, rather than carry on to Terrace Bay. 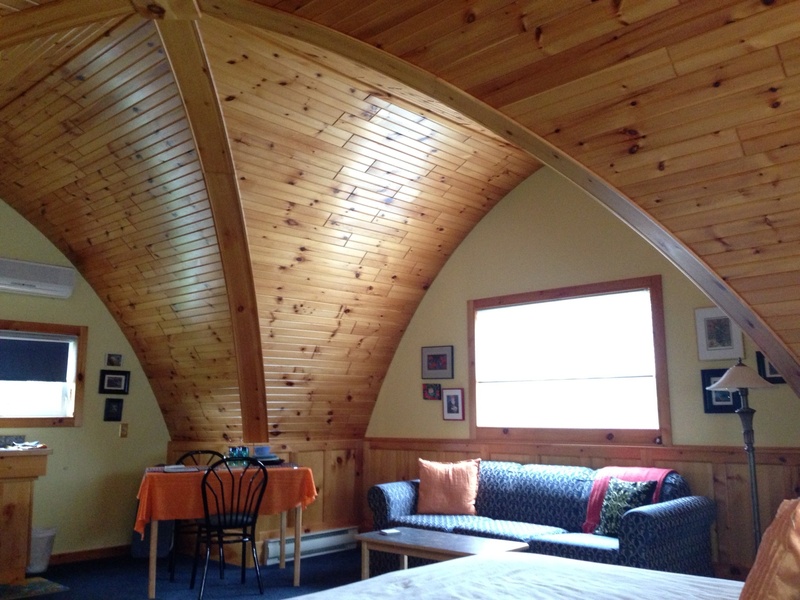 We had a great lunch of homemade veggie burgers and salad, chocolate cake and chocolate cheesecake and then checked in to our room at the guesthouse, which is a delightful second floor suite with a gothic arched ceiling and lots of light – serendipity! 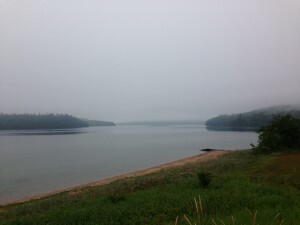 Rossport was the site of the First Nations village of Bawgawashinge. 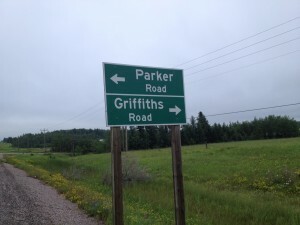 The Pays Plat First Nations is now located just west of Rossport. The day began well, at a small Italian coffee shop close to the motel. The latte and espresso were good and we left with fresh cinnamon buns and sandwiches for lunch. 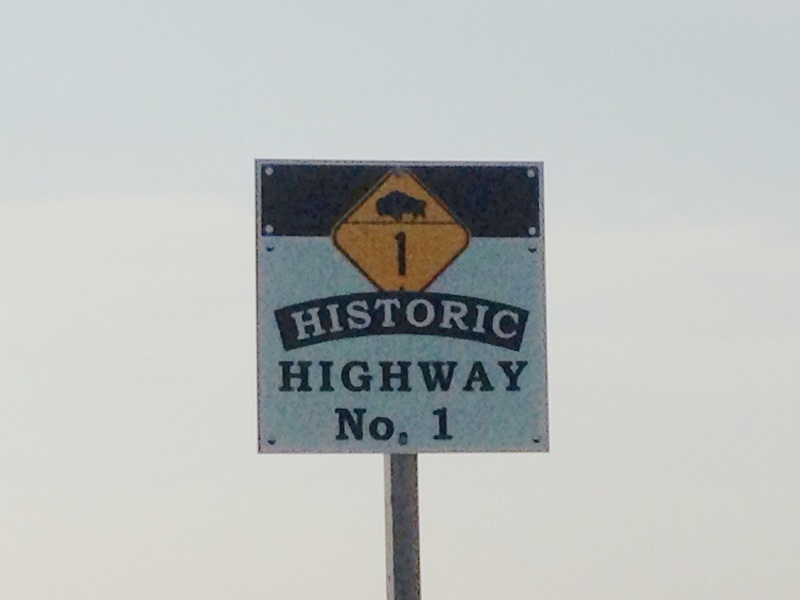 We headed back down Highway 61, the Thunder Bay Expressway (Highway 61 starts in Thunder Bay and ends in New Orleans – for a wonderfully quirky movie, see Bruce McDonald’s film, Highway 61 ). 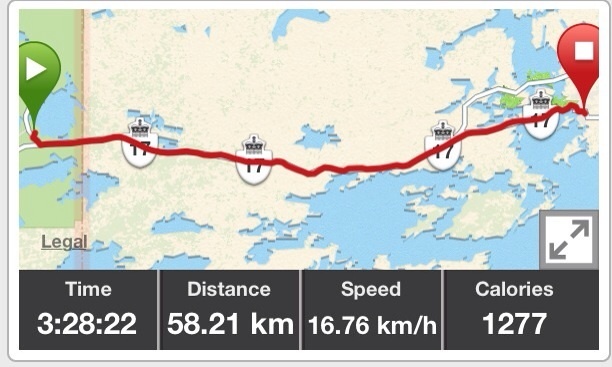 After a few kilometres, now merged onto Highway 17, we were stopped by a police officer on a motorcycle. He told us that bicycles were not allowed on this stretch of the highway as it was too dangerous. It was apparently posted as being prohibited to bikes and pedestrians, but neither of us could recall any signs, and no blogs had mentioned this either. Later, we would have liked to have told him what we thought of the safety of the road ahead. Anyway, he said that he would not ticket us the $60 fine, but we had to exit just down the road. 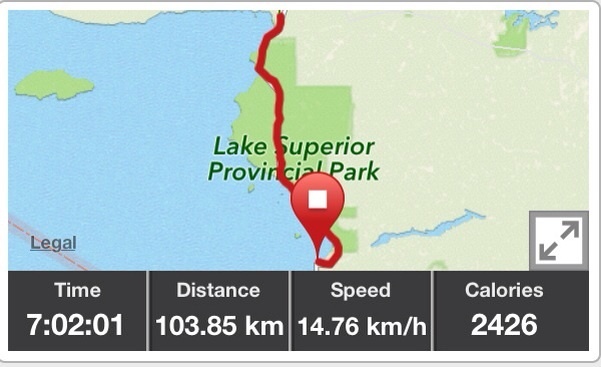 Our Garmin directed us to Lakeshore Drive, which was a relatively quiet route close to Lake Superior. 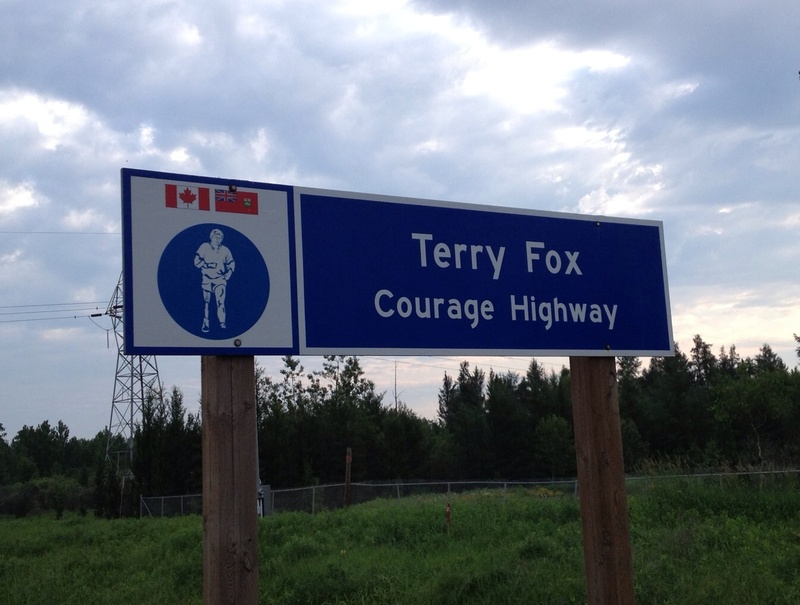 This would have been OK, except that we were disappointed to miss the Terry Fox Memorial on the main highway. It is obvious from our reading that others had ridden past the spot. We were unlucky. 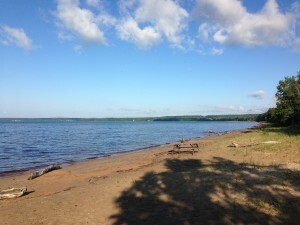 We stopped for a break at Wild Goose Park by the lake, in Shuniah. When the road eventually brought us back to the highway, the hard shoulder had decreased markedly, disappearing completely at times, and was pretty well like this for the next 80 kms. Despite it being a Saturday, the truck traffic was very heavy. Again, we had to veer off into the loose gravel to avoid trucks or being hit by oncoming traffic that passed into our lane right beside us. It was not a fun day! 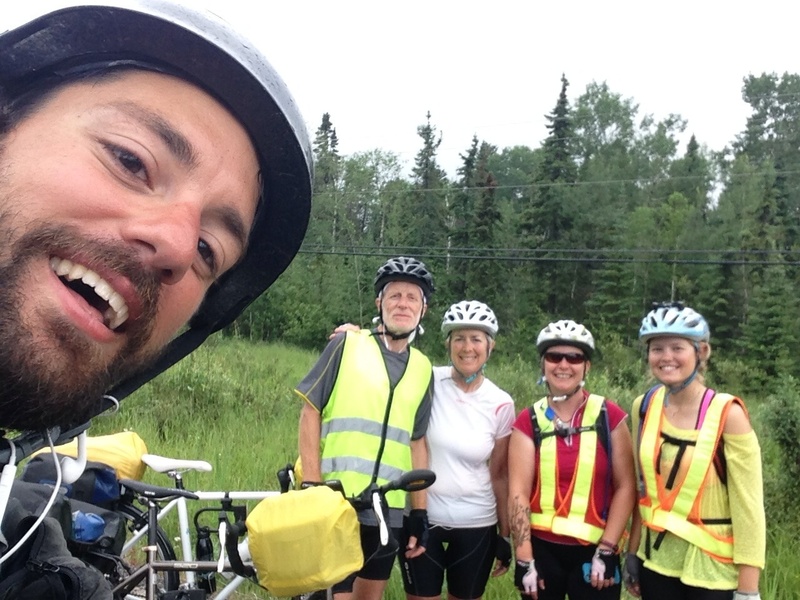 We met Steve, from Montreal, who was heading West and onto the Yukon. We had a joint rant about the narrowness/absence of hard shoulders and compared notes on our respective journeys. Yesterday, he had to walk his bike for an hour because of the headwinds! He has been travelling for 3 years, in Europe and across the US and Mexico. After Alaska, he will be going to Bolivia. We dined at the Husky Truck Stop in Nipigon. We are on the traditional territory of the First Nations of the Robinson Superior Treaty. The Ojibway Lake Helen First Nation is located just north of Nipigon. The City of Thunder Bay is very spread out. The centres of the constituent communities of Port Arthur and Fort William are 7 kms apart. Although they were amalgamated in 1970 to create Thunder Bay, we were told that the communities remain fairly separate. It was certainly confusing to get around and we spent more than we should have on taxis as our hotel was on the edge of the city. 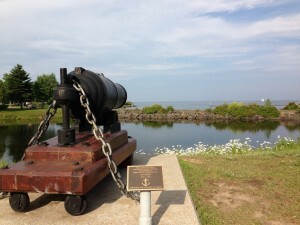 We explored the Algoma Street area of Port Arthur, which is near the lakeshore that we visited yesterday. We found espresso and vegetarian chilli at the Bean Fiend, where we video-chatted with Jade and Rhys, Maritia and Steve. Then Lois went off for a birthday pedicure while Paul shopped for new bike gloves. 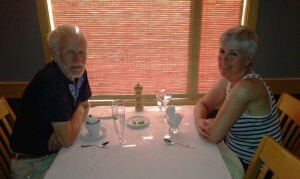 We had tea and scones at the International House of Tea and later dinner at Bight. 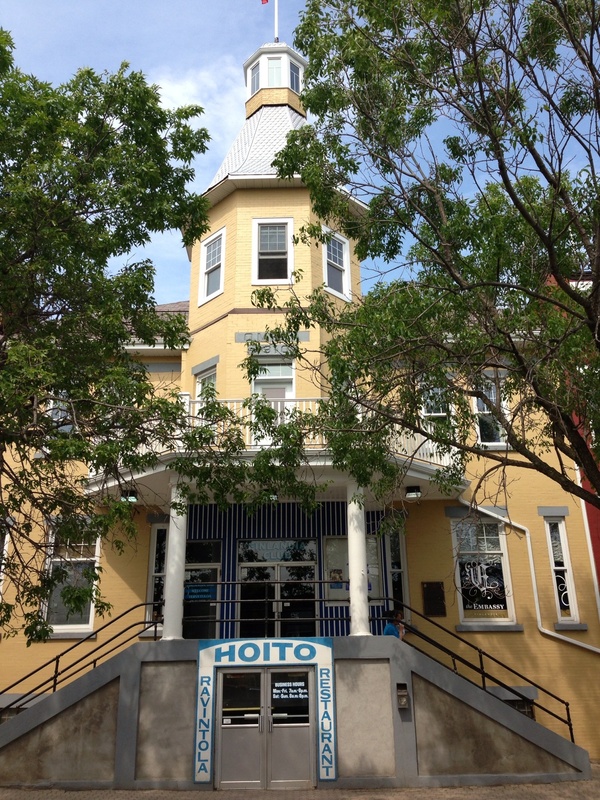 Unfortunately, we did not get to Hoito as recommended by Maritia from the time she spent in Thunder Bay doing an outbreak investigation. Thursday July 11, 2013. Day 41 and Lois’ Birthday ! 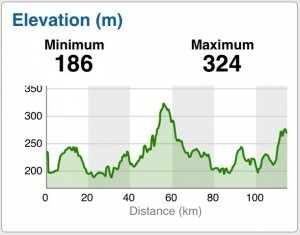 The morning was bright, the sky was blue, breakfast was very good, there was a tailwind and hard shoulders. Fitting for a birthday! Lois was particularly excited about the hard shoulder! 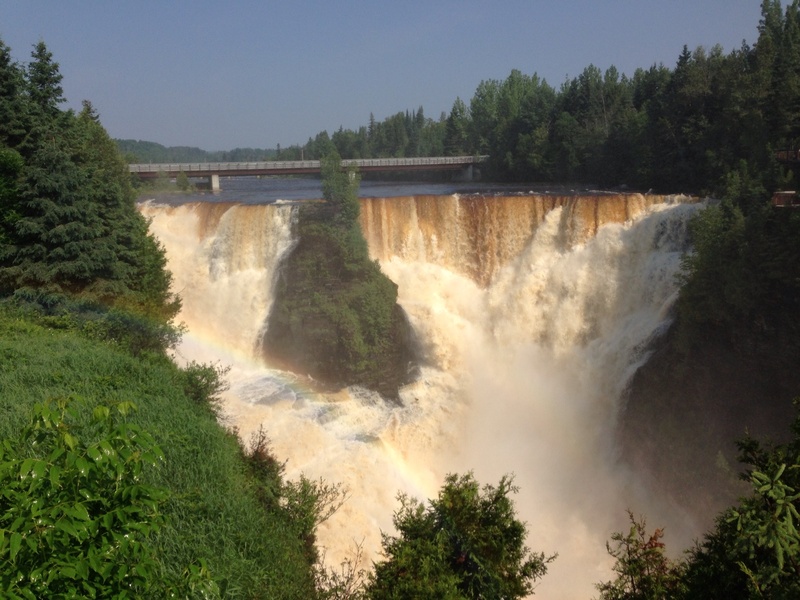 We visited Kakabeka Falls, the “Niagara of the North”, which are quite spectacular. The falls are on the Kaministiquia Rivera, which was a major route to the northwest for the Voyageurs. The name “Kakabeka” comes from the Ojibwe word gakaabika “waterfall over a cliff”. The rock face of the falls contains some of the oldest fossils on earth and the colour of the water reflects high concentrations of iron. We had camped at Kakabeka Falls Provincial Park when travelling as a family, in 1988. We had lunch at the Metropolitan Moose in Kakabeka Falls. After checking into our hotel in Thunder Bay, we managed to spend a few precious minutes with Tom Dignan, a colleague of Paul’s, who was on his way to the airport. We then took a cab to the Marina, which is part of a large redevelopment of the downtown waterfront. Nearby is a Spirit Garden which recognizes the First Nations presence in the area. Walking around it not only gives you a sense of the relationship of peoples to the land and Lake Superior but also a view of the “Sleeping Giant”, as well as old grain elevators on the shores, reflecting the previous importance of shipping to the local economy. Another part of the development centres around the 1906 Canadian Northern Railway Station. The Baggage Building Art Centre is housed in an historic freight shed. 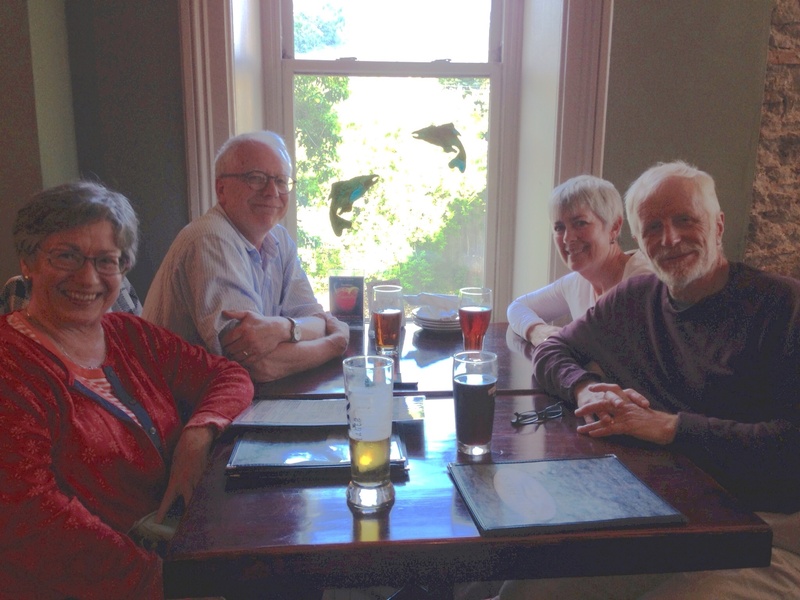 With a recommendation from Maritia’s friend, Maureen, we headed to The Caribou Restaurant and Wine Bar for dinner. The Lake Superior “Red Fin” Trout was outstanding. 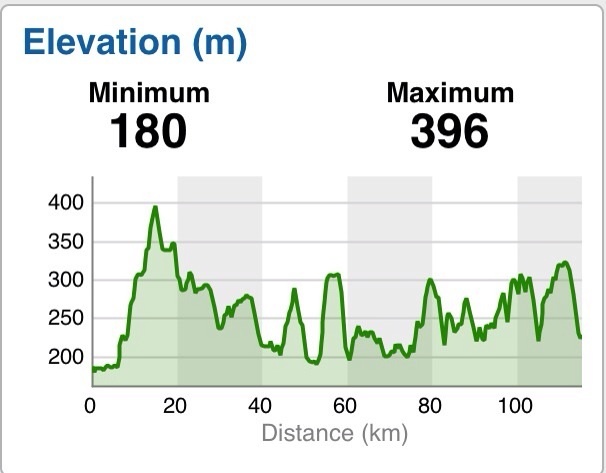 We are looking forward to a day off tomorrow, after 9 days on the road. Lois: 64 and I have never felt more alive! This trip is amazing! The Black Spruce Motel, just outside Upsala, was yet another breakfast haven and the vegetarian Denver sandwich that we took away for lunch was delicious. The server said that she often gets asked what time it is, and she responds with “that depends on which direction you are travelling” to the surprise of the requester! Although we officially crossed into EST a few kms on, Upsala decided to adopt Eastern time as it does most of it’s business with Thunder Bay. The owner, who works 18 hour days April to October and spends his winters in the south and back here ice-fishing, told us that a man in his 90’s was cycling through last year from Vancouver to London, Ont. He was hospitalized for dehydration in Winnipeg, but carried on after, only permitted by the doctors if he had someone to ride with. We continued on a very narrow shoulder and dodged trucks again. Canoeing, as per before the highway, would have been safer, but not as quick. It became hillier and we crossed the Arctic Ocean/ Atlantic Ocean height of land, although at only 504 metres. With a tailwind, we were flying. Having cycled against the wind so much on this tour, we forget how beautifully these bikes ride in good conditions! It was a short day and later we were sitting outside our “cabin” at Oskondaga River Outfitters, having tea in the sunshine. At supper we met fellow cyclists, Paul and Joe. Paul is from Manchester and Joe from Kingston. 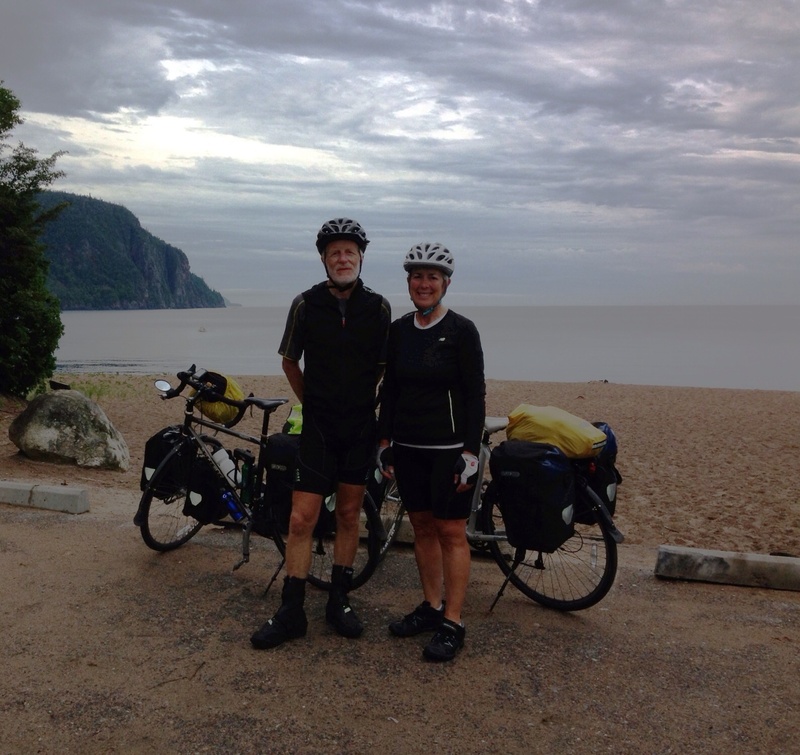 They both started from Victoria but have been travelling together since Alberta. We swopped many stories and experiences over a great meal which included pickerel caught by the owners’ grandson. Paul had hit a pothole in Manitoba and bent his front forks as well as suffering bruises. 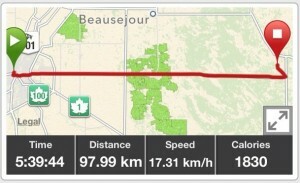 He had to get a lift into Portage and then took the bus to Winnipeg to get his bike fixed. Scary as well as good stories were shared. We are now on the traditional territory of the First Nations of the Robinson Superior Treaty of 1850. The Tower Hill Truck Stop in Ignace was a good place for breakfast, except for the coffee. 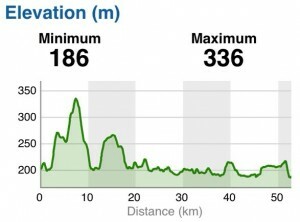 Today was an easier day – fewer hills, a constant tailwind and cooler weather – but the terrain was less interesting. 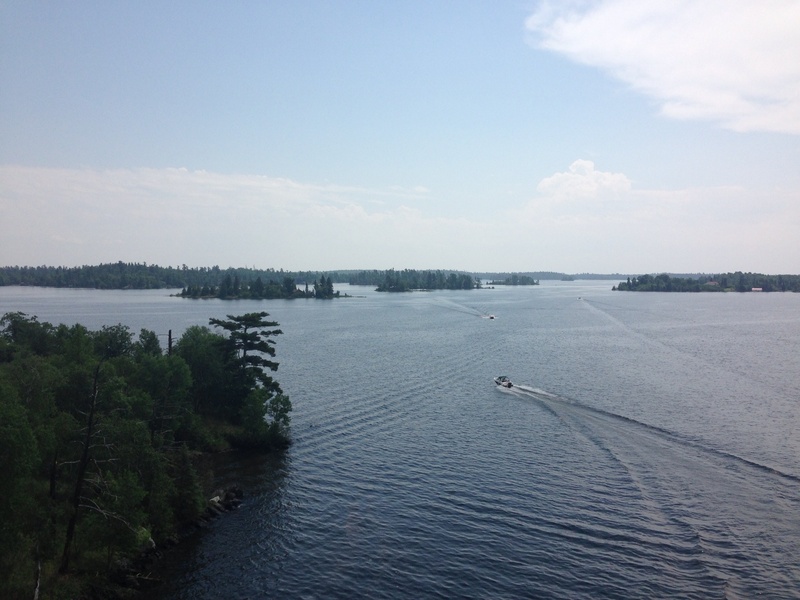 The land is characterized by fishing (lakes and lodges) and lumber (evidence of old and newer logging). 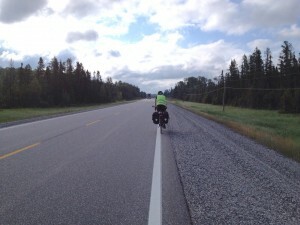 The narrow shoulder, which requires us to ride very close to, or on the 2-laned highway, was mostly ok, as the trucks generally move over for us. We had to dive into the soft shoulder a couple of times for wide loads or when trucks were passing in both directions. After a couple of instances where oncoming traffic crossed into our lane to pass right beside us, Paul put on his bright flashing headlight, which may have worked as it didn’t happen again. We hope that the wide shoulder reappears after Thunder Bay. 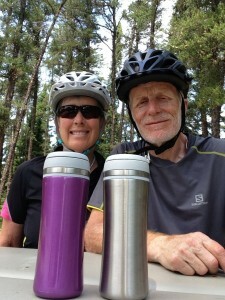 We stopped at a picnic site at Lodge Lake to make espresso and have an early lunch. 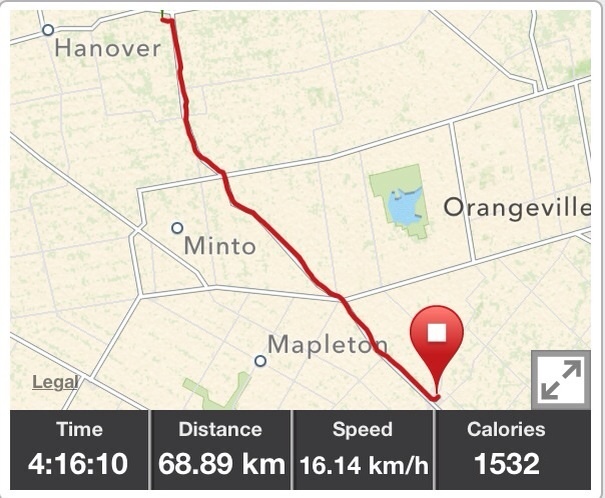 That turned out to be the only place to stop during the entire ride. 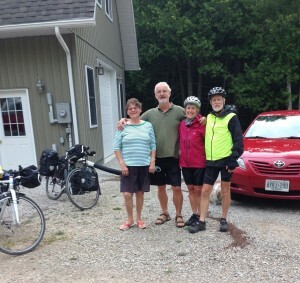 We met a cyclist, Barry, coming from Toronto on his way to Vancouver. He was a bit disconcerted when we told him there was nowhere to buy lunch for 60 kms! We offered him some food and he accepted a banana. 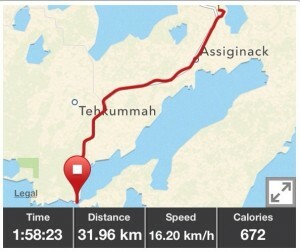 About 30kms before Upsala, a severe thunderstorm warning flashed across the Garmin. Fortunately, the rain began only as we arrived and we were able to take refuge in the Shell station cafe where we discovered they make good homemade bread and butter tarts. Tanya and Jocelyn turned up, a little damp and joined us. Wayside Notes: examples of detritus up to now: multiple rubber straps and bungee cords, assorted nuts and bolts, a wallet, keys, a Blackberry, wrench, fly swatter, two toy fishing nets, and the remains of numerous tires and constituent wire, which caused at least two of our flat tires. Wildlife Notes: American Bald Eagle close by the road (and one yesterday), no moose. 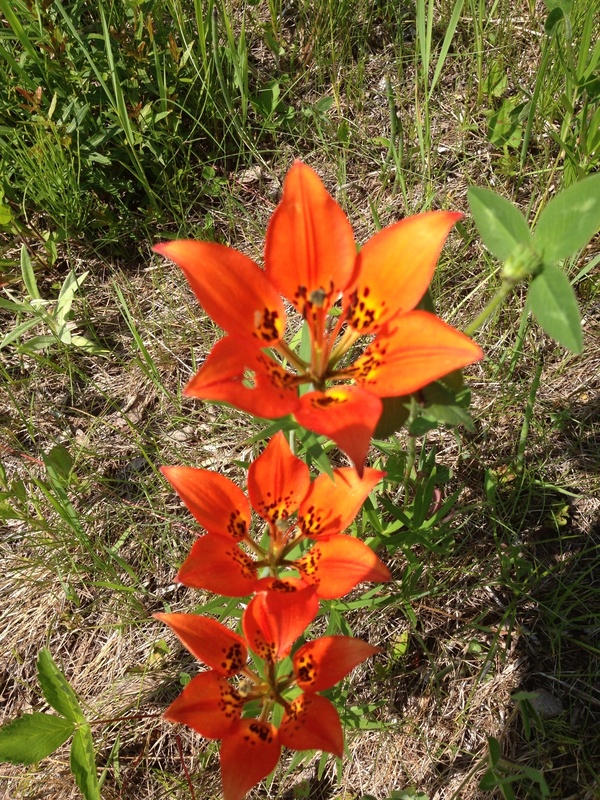 We remain on the traditional territory of the Treaty 3 First Nations and Ojibway Peoples. 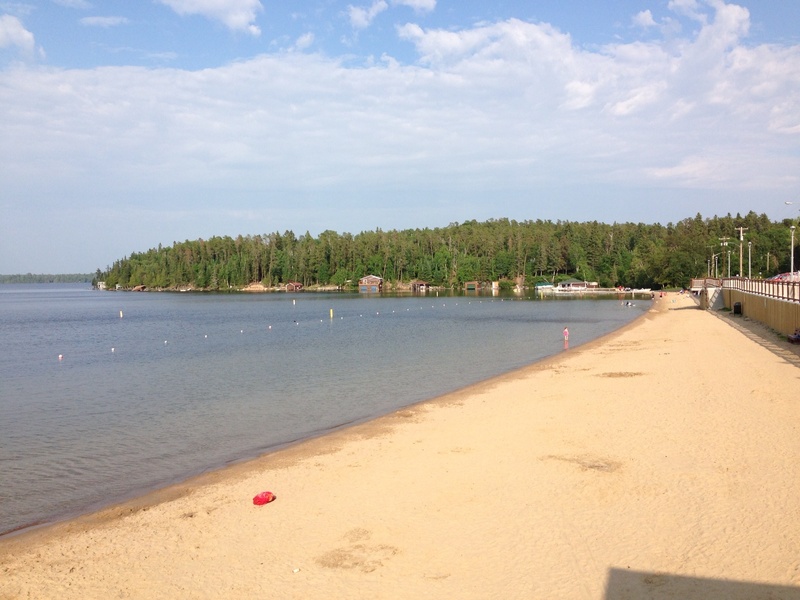 The Lac des Mille Lacs First Nation is situated close to Upsala. 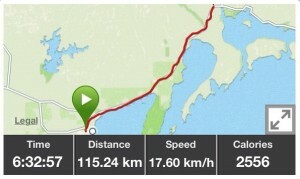 It was hot, but we had a tailwind most of the day. The hard shoulder was only about half a metre for the majority of the day and will be like this for the next three days. Paul remarked on the colourfulness of the rocks, flowers, lakes and sky but Lois was of the opinion that he was suffering the heat at this point! We stopped at a picnic site beside Revell River and drank tea, made in our David’s Tea mugs this morning – it was still warm! At an ice cream stop at the end of the day we met up again with Tanya and Jocelyn and we all chatted to another person who was really enthusiastic about our trip. Yesterday, we talked to a tour guide from Quebec who’s life dream is to traverse the country by bicycle. We are gratified that we continue to get encouragement, astonishment and praise (and occasionally envy) from people like this every day. 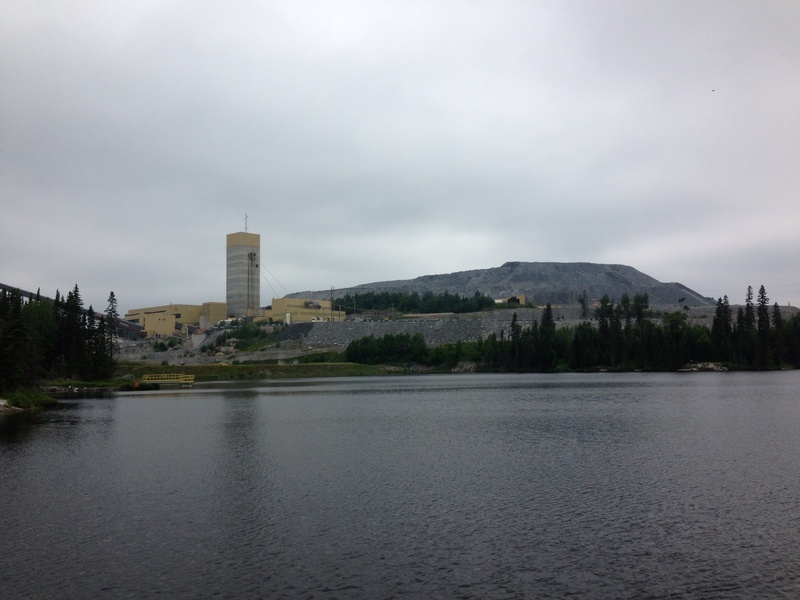 Ignace was named after Ignace Mentour, the key First Nations guide during Sir Sandford Fleming’s 1872 railway survey. 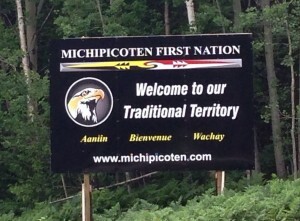 We remain in the traditional territory of the Treaty 3 First Nations of the Ojibway Peoples. We were awake early by the drone of mosquitoes and didn’t want to wait around until the local cafe opened at 8:00, so we prepared instant oatmeal using hot water from the motel coffee maker (not a good idea!) and shared a cinnamon bun we’d bought last night. The rain had just stopped, but it was very misty and we had to put on our headlights. It was a short ride, but with many hills and a headwind, we were happy to get to Kupper’s Bakery in Dryden for Sunday Brunch. 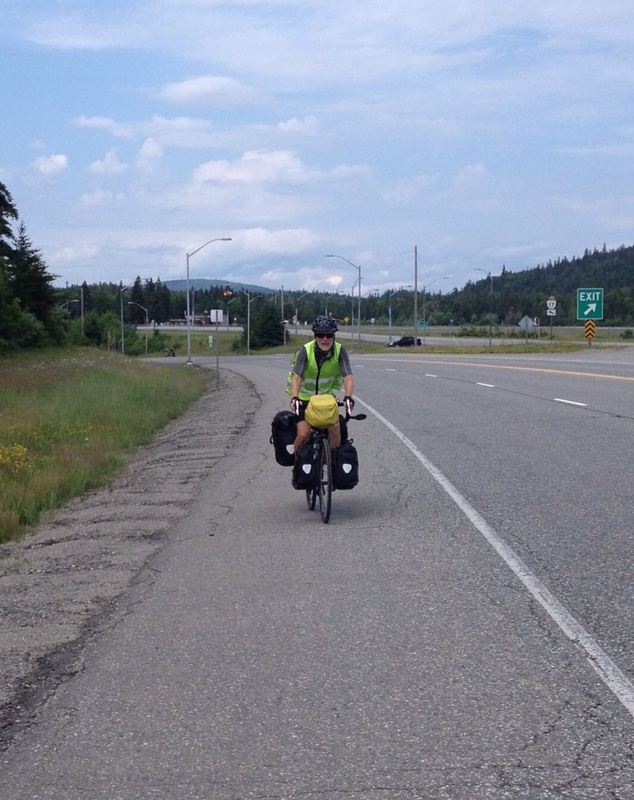 On the highway, we met another cyclist from Vancouver, Karim, who was crossing the country east to west. We will look him up on our return. He works in a bike store on Broadway not far from us! The lumber industry is important to the economy of Dryden. There is a large paper mill right in the town by the Wabigoon River. 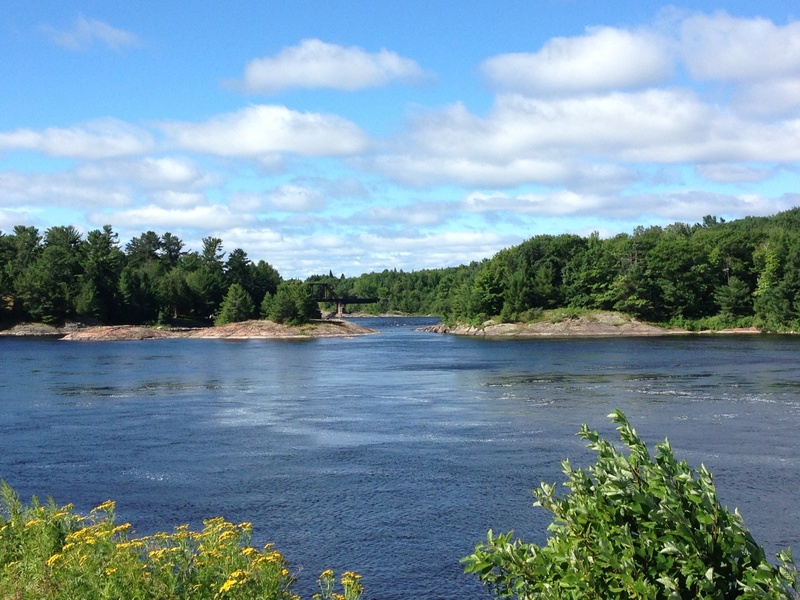 In the 1960’s, the Dryden Chemical Company, which supplied the mill, was the cause of extensive mercury contamination of the Wabigoon/ English River system. The results were devastating for some First Nations communities in North Eastern Ontario. The Wabigoon Lake Ojibway First Nation is situated close to Dryden. For our friends Rod Griffiths and Lois Parker. “Rocks and trees and trees and rocks and rocks and trees…and water.” The Arrogant Worms sum it up! 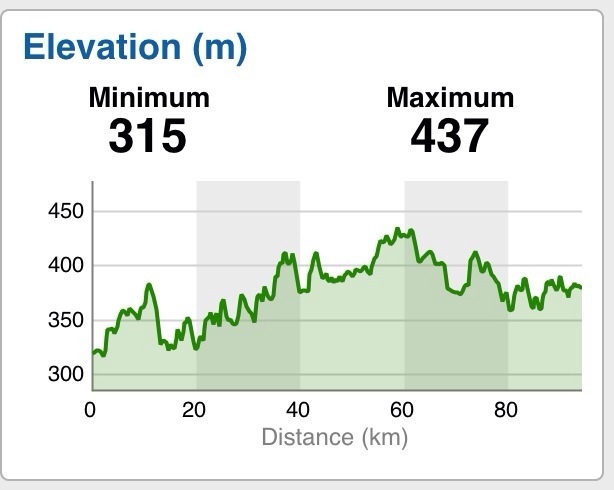 We also had hills today, and a headwind. 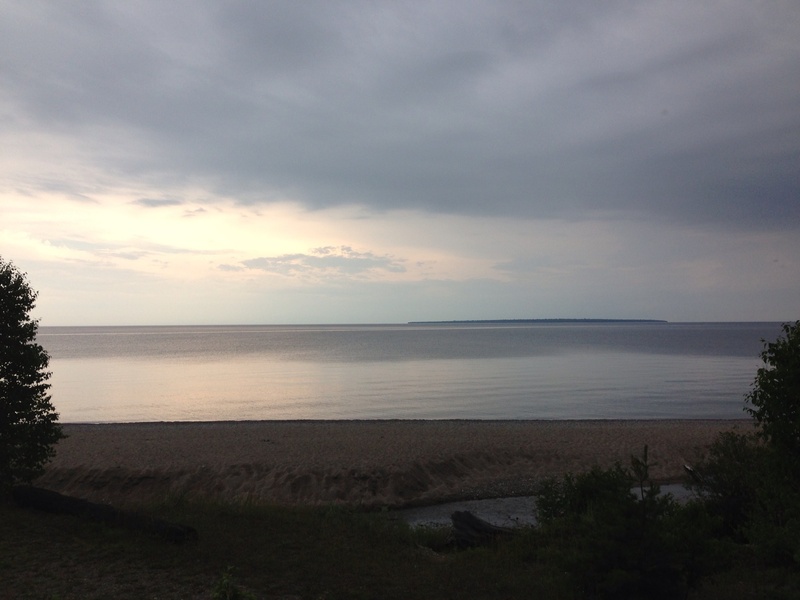 But the beauty of the surroundings and cooler temperatures (i.e., cloudy, threatening to rain all day) made it a pleasant, if sometimes moderately challenging, day. We saw a cyclist parked on the other side of the highway, so went across to say hello. The two cyclists we met yesterday, Tanya and Jocelyn, had also stopped to talk with him (Alex) and we took group photos. 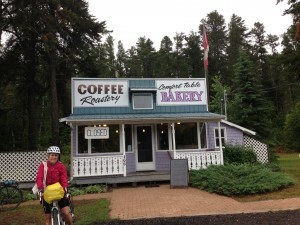 Riding into Vermilion Bay, we noticed a bakery/roastery, which closes at 6:00 and is not open tomorrow, so we quickly checked into our motel, dumped our panniers and pedalled back quickly (now in the pouring rain) to enjoy good lattes (! ), excellent corn chowder, roasted vegetable quiche and lemon tart. We also stocked up on goodies for tomorrow. Wildlife Notes: Snapping Turtle (roadkill). Question: why did the tortoise cross the road ? 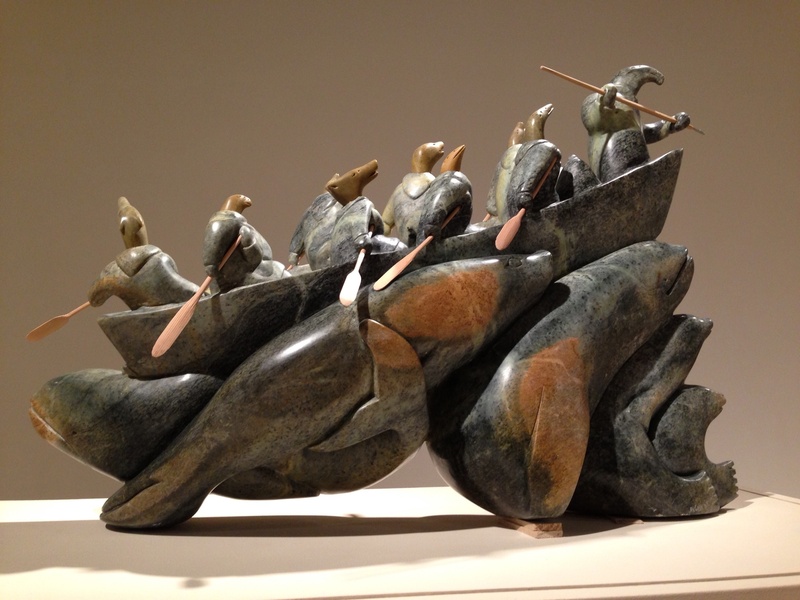 We remain in the traditional territory of the Ojibway Peoples and the Treaty 3 First Nations. The Eagle Lake First Nation is situated close to Vermilion Bay. A few minutes from West Hawk Lake, we joined the TransCanada, which, we were pleased to see had a newly paved hard shoulder. Soon after, we were at the Ontario border! A couple of bikers on the other side of the highway, who were on their way to Rocky Mountain House from Sudbury, took our photo for us. 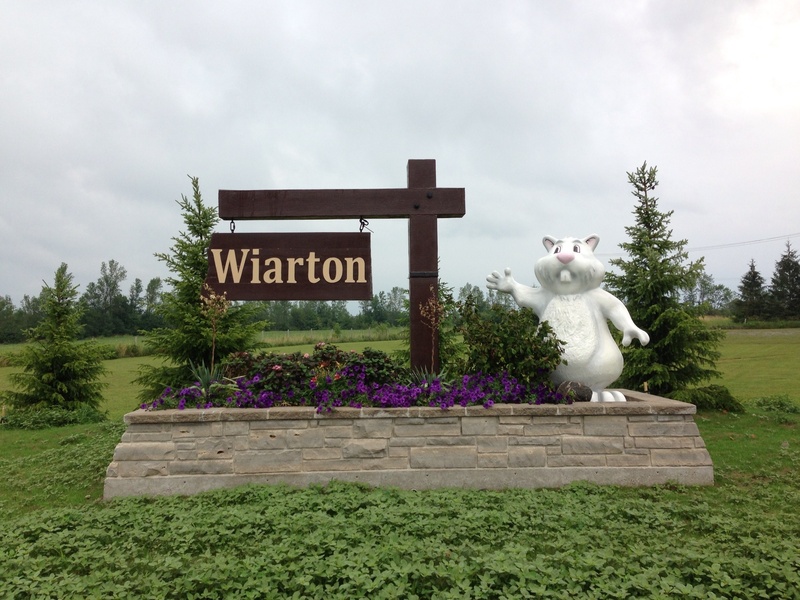 Just down the highway, at the Ontario Information Centre, there was a nicer sign, so we stopped for more photos. Here, we met a couple of cyclists, from White Rock, BC, Tanya and Jocelyn, who are also heading to St. John’s. They are riding in support of Alzheimer’s awareness. They expect to get to Newfoundland around the end of August, so we agreed we would celebrate together if we arrive at the same time. 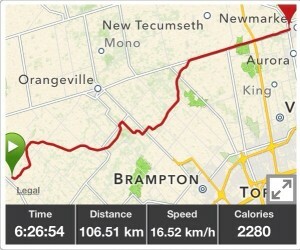 It was a pleasant, fairly easy, ride along the #1, which turned into the #17 in Ontario. 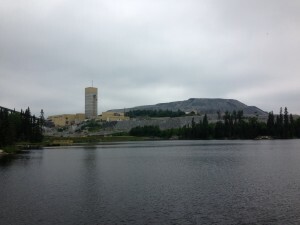 The wide paved shoulder continued all the way and the scenery was dramatic, with boreal forest, rocky outcrops and many lakes. 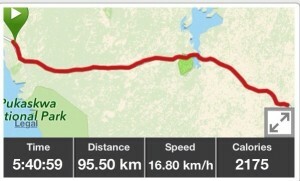 We also passed the 3000 km mark today. Kenora is on the Lake of the Woods. We stood by the shore on the way to the Brewing Company of the same name. They opened 2 weeks ago and their first beer, a blonde ale, was enjoyable. We are on the traditional territory of the Objibway People’s, and specifically the Kenora First Nation. 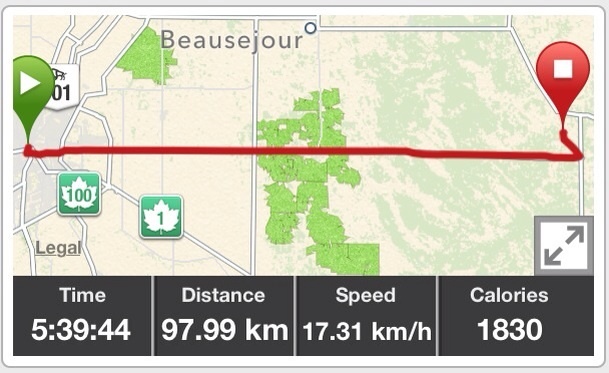 We left the B&B shortly after 7:00, heading north alongside fields of canola, corn, wheat and barley. We turned east onto the #44 (the old Highway 1) and almost immediately found ourselves on the Canadian Shield. The road was quiet and the scenery was novel, for now. Apart from dealing with one flat tire, the morning was uneventful. Later it got hotter and there was a headwind, which might have helped drive away, slightly, the multitude of horse flies that descended on us while moving. West Hawk Lake is the deepest in Manitoba (111 m) and is in a meteorite crater from 100 million years ago. 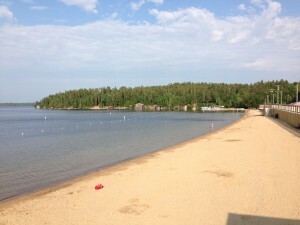 The community grew up around the old Highway 1 and today appears to be a thriving resort. It is attractive, well laid out and has a lovely sandy beach. 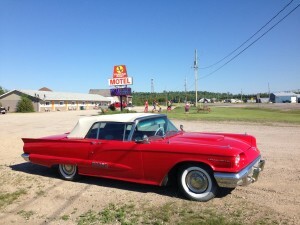 The Nite Hawk Diner is listed as one of Macleans “great Canadian pit stops”, and deservedly so. We remain on the traditional territory of the Treaty 3 First Nations. We checked out Stella’s Bakery yesterday and were there again this morning for 7:00 opening. After a good breakfast and fuelled with espresso and latte, we headed out of Winnipeg, crossing the Red River Floodway, which last protected the city in 2009. 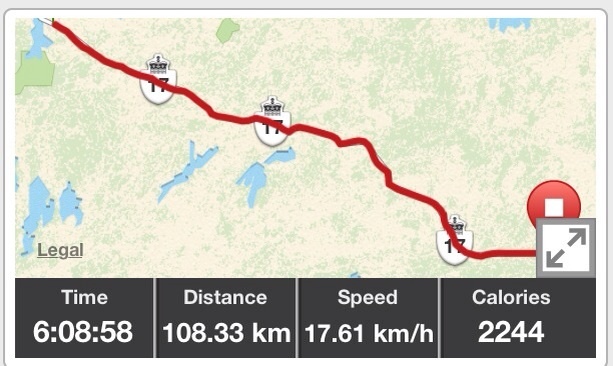 We avoided the TransCanada, as we were told at Manitoba Tourism that after about 20km there was no hard shoulder before the Ontario border. Highway 15, just north of #1 was a good alternative. Even though it also had no hard shoulder, it was relatively quiet once we were out of the city. The wind was behind us but it was very hot – mid 30s, with little access to shade along the road. We crossed the longitudinal centre of Canada, twice! There seems to be some dispute as to the exact measurement so we recorded both. This does not mean that we are half way through our trip though. En route, we talked to Maritia and then were surprised by a video call from Chris and Shinyoung, while we were resting in some shade by the roadside. We stopped in Elma at the Spicy Radish for homemade iced tea and a milk shake and ordered homemade veggie burgers, yam fries and pecan pie to take to our lodgings. We are staying in Moon Gate B&B, an idyllic spot a few kms off the highway, right beside the Whitemouth river. We considered going for a cooling swim in the river, but fatigue defeated us. 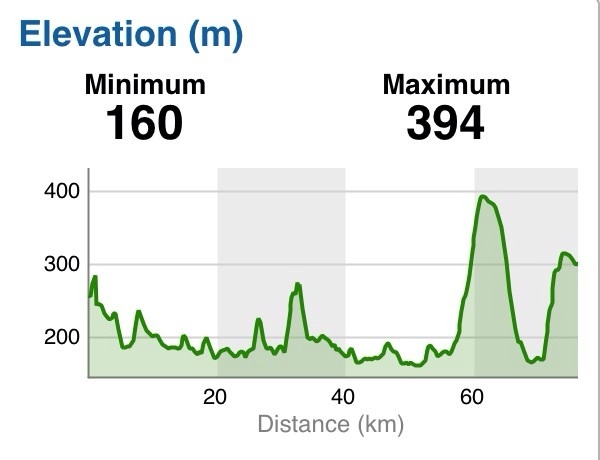 We plan to set off even earlier tomorrow, to get some kilometres in before the temperature soars again. We are now in the traditional territory of the Treaty 3 First Nations. Highway 15 passed by the Metis community of St Rita. 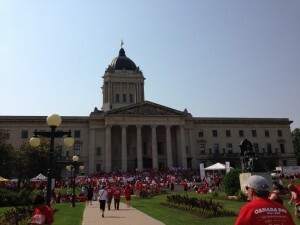 Canada Day in Winnipeg: After the obligatory laundry and bike maintenance, we walked to the Legislature and found a crowd of people in red and white, ready for the human Canada Flag event. Wandering, we stopped at the statue of Louis Riel, who, as the founder of Manitoba, holds his rightful place on the bank of the Assiniboine. We couldn’t walk along the river trail as it was flooded and the water is not yet as high as expected, with flow from the rains which have caused flooding in Alberta still to come. At the Forks (where the Assiniboine joins the Red River), there was entertainment and also the Founding Peoples celebration at the Oodena Circle. 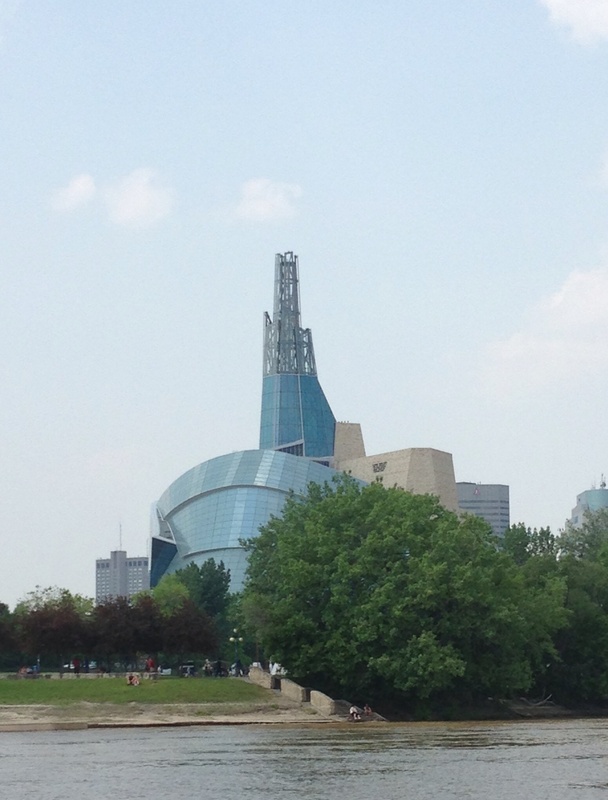 A 1/2 hour boat trip gave us a good view of the Museum of Human Rights, which opens in 2014, the Provencher Bridge and the St Boniface Cathedral. We had hoped to stay to see the fireworks, but retreated early to our air-conditioned hotel. Today, we met a group of cross-Canada cyclists outside a bike shop. We don’t think that they believed us when we said that we were doing the same thing until we showed them our bike tans! An exhibition at the Winnipeg Art Gallery, The 100 Masters, Only in Canada, was amazing. 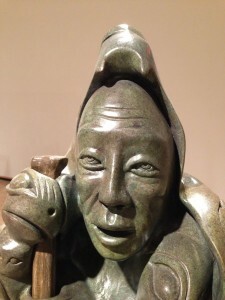 A celebration of the gallery’s centennial, it is an assembly of one hundred works of art from twenty-eight museums in Canada and two in the United States, along with ten pieces from the WAG’s permanent collection. 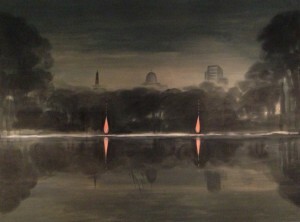 1/2 of the works were by Canadian painters, some of whom, we were ashamed to admit, were unknown to us. Our euphoria continued through a dinner at Sidney’s, where every course was memorable. It will make up for the limited options available back on the road. 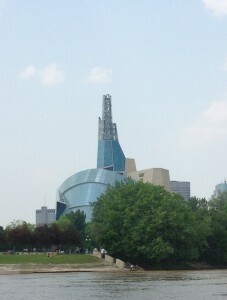 To end the day, we walked around the site of the Museum of Human Rights. 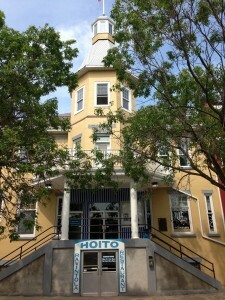 It is an inspiring building even now. The Wanda Koop painting, included in the 100 Masters, entitled “Native Fires” is “a poetic and political mediation on the legacy of colonialism in Winnipeg. It captures a long-standing divide within the city between the First Nations community which had gathered at campfires along the city’s river shores, and the institutions of government, jurisprudence and religion”.